An up to date summary of Nottinghamshire butterflies has long been overdue. So in an effort to make something available online, we have produced what we think is an up to date species list and accurate summary of how the county's butterflies have fared over the past couple of decades. As part of the process, we have reviewed the county's historical species accounts and records left to us by J.W. Carr, in his book 'The Invertebrate Fauna of Nottinghamshire. Nottingham: J.& H. Bell Ltd (1916)' whilst at the same time, filtered out or highlighted some of the more suspect recent records. Hopefully and at the end of it all, we have produced a reliable county species list from the resources and information we have available. 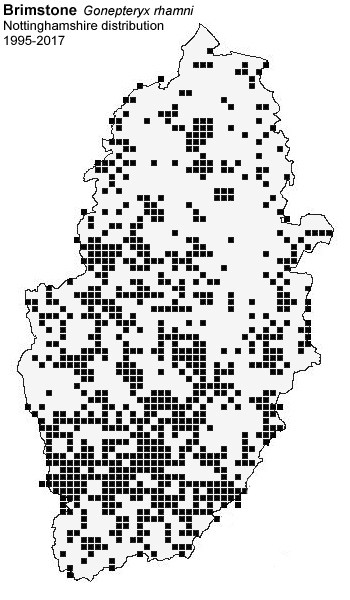 The NBN Atlas has occasionally been referred to, to check for any additional county (VC56) records of the rarer species, but it had very little to offer as an online resource for tracing previous Nottinghamshire records. Yet again, there proved to be a huge gap in the county's available online records, after Carr produced the follow up supplement to his original work in 1935, up to the early 1990's. Our biggest debt of gratitude has to go to outgoing county butterfly recorder Richard Rogers, who helped us enormously with this project and to those people who sent us records making this review possible. Nottinghamshire's historical records were certainly in need of some form of review. Even to Carr himself, it was clear that there were some extremely contentious and dubious records produced in his historical species accounts of just over a century ago. Carr relied heavily on two species lists when researching records for his book 'The Invertebrate Fauna of Nottinghamshire. Nottingham: J.& H. Bell Ltd (1916)' and was reluctant to use most of the records attributed to W.J. Sterland's list 'Lepidoptera taken in Sherwood Forest by the late John Trueman' and even had doubts over some of Sterland's own records. The other list produced by R.E. Brameld, was felt by Carr to be considerably more reliable and we feel that he was indeed correct in his preference for Brameld's more reliable list and his recording. If you have access to Carr's book, you will find it is littered with the most improbable and unlikely records of both butterflies and a whole host of moths that were only recorded or listed by Sterland. Carr states his reasons for his lack of trust in Sterland's records by stating that 'Sterland's list, although it professes to include only those species which Trueman himself collected within the limits of the Forest [Sherwood Forest] contains so many improbable records, that one is forced to the conclusion that numerous species are included, which were collected by Trueman in other parts of the kingdom, or recieved by him from correspondents'. Carr then states that he felt 'compelled to ignore many of Sterland's records, unless confirmed by Brameld or later observers'. The timing of any record or status review is perhaps most appropriate, as we have been able to compare anecdotal evidence for some species more than a century later. Have all our butterflies declined greatly in the way that we assume from the continuing adverse press and publicity reports? The answer would seem to be no, certainly not for all of them anyway, and the history of quite a number of species actually end up with some degree of success. Nottinghamshire's resident species have of course suffered some losses (five species) and we seem to be on the verge of losing the Wall Brown through a natural decline, which (although not good) should perhaps be expected over such a number of years and changes within our climate. But we have naturally gained both the Essex Skipper and Holly Blue - two new species that were not reliably recorded or verified a century ago and possibly even Brown Argus - if the old records were unreliable. A total of six species are showing (or have showed) large increases in their Nottinghamshire range and some 16 species are probably as common now as they were in the 1900's, allowing for a reduction in any specific habitat requirements. Of those butterflies we have lost, their demise as breeding species cannot be wholly attributable to climate change, modern farming practices, or habitat loss within the last 50 years or more, as they were already in serious decline, or had already died out, when Carr was researching and sourcing records for his book. The following bulleted list, provides a brief summary of the county's gains and losses. First and last recorded dates are bracketed if known. We've also looked at those species that have (rightly or wrongly, depending on your views) been released into suitable habitat using captive bred stock. At least five species are known to have been released and contrary to popular belief, not all releases have been conducted by the same person. Some releases are more successful than others and able to maintain a population for a number of years. If a released species is still at a site a decade later, then it's done well, or that species has also undergone a natural range increase, augmenting the released population and refreshing the gene pool of that released population. 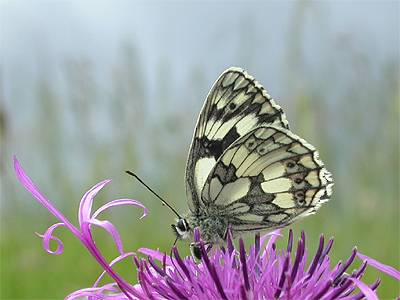 The Marbled White is mentioned twice in the above bulleted list, as it was known to have been released in the 1990's, but there has also been a natural range increase and colonisation of this butterfly, which has helped it increase to a level doubtfully ever seen in Nottinghamshire before. Other released populations gradually dwindle if the released stock doesn't have enough genetic variation and this seems the likely cause for the loss of the originally released White Admirals in woodland near Retford. The subject of people releasing captive bred butterflies into the wild, has long been a contentious issue among naturalists. Opinions on unofficial releases of native butterflies vary and the person responsible for some releases in the county, is well known in butterfly circles and has often been vilified for his actions in the past. However, there are other people who have released captive-bred butterflies in Nottinghamshire. Whether you agree with releases is a matter of personal choice and in cases where a species is not native to the UK, it is clearly wrong and we would not agree with such actions. However, we are not of the opinion that all releases are to be condemned outright and those who have deliberately travelled to, and enjoyed seeing butterflies such as Marbled White, Silver-washed Fritillary and Purple Emperor in Nottinghamshire, are effectively condoning such releases and certainly enjoying them. The following species and sites are only the releases we know of, but there are undoubtedly both more species and sites involved. Any potentially new species for Nottinghamshire, or the sudden reappearance of a formerly occurring species over the next few years, should always be treated with caution. As far as we are aware, there are no species naturally expanding either their European or UK ranges, making them expected in Nottinghamshire over the next decade or so. 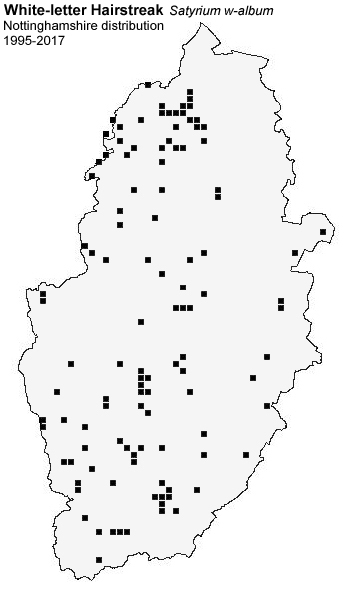 These species and their corresponding records have been rejected from the proposed Nottinghamshire species list, although some were included in the lists of previous authors. Quite a number of records date back to the 1800's and early 1900's and were rejected, or disbelieved by Carr at the time. 58.001/1541 Leptidea sinapis Wood White (Linnaeus, 1758) ... Sterland claimed the Wood White was 'occasional in Sherwood Forest', but Carr described it as being 'long extinct in Nottinghamshire, if ever really indigenous' but went on to list a record of a 'single specimen taken at Newark many years ago (G. Gascoyne in Newman's British Butterflies). However, such records cannot be deemed acceptable on the basis of no precise date or location and Carr should have disregarded both claims. Any Wood White seen in Nottinghamshire, has certainly been captive bred. 58.005/1548 Aporia crataegi Black-veined White (Linnaeus, 1758) ... A single claimed record from Nottinghamshire. Carr completely (and quite correctly) disbelieved the record, stating that 'the claim of this beautiful insect to rank as a Notts species, rests solely upon Sterland's statement, that a single specimen of the Black-veined White (P. crataegi) was taken by J. Trueman, but he does not give in his memoranda the precise locality, though I gather it was in Thoresby Park'. Carr goes on to argue his case for doubting the record, stating that 'in view of the southern range of this species, its occurrence in Notts, can hardly be accepted and the record is probably due to some misconception'. Referring to what we stated earlier, then this record would perhaps illustrate more than most, Carr's lack of trust in Sterland's records, forcing him to the conclusion that some species were probably collected by Trueman from other parts of the country, or sent to him by a number of friends and acquaintances. 59.001/1630 Danaus plexippus Monarch (Linnaeus, 1758) ... There is a single record of a specimen found roosting at Sherwood Forest Centre Parcs on 13/09/17 (Hill, M.), but it is doubtful that any Nottinghamshire record would ever be considered as being of a genuine vagrant. Had this record been from the south-west of the UK, then it would probably have been considered very differently. There were no other Monarch records from elsewhere in the UK at the time, but the preceding couple of weeks had seen westerly winds associated with a string of Atlantic weather systems. Perhaps in view of the Pine forest habitat the specimen was found in, there could well be a case for it being of genuinely wild origin, but the record would never be accepted. 59.004/1628 Coenonympha tullia Large Heath (Müller, 1764) ... The NBN Atlas lists a single Nottinghamshire record. Further investigation soon revealed that there was no observer associated with the record, it was only dated as 1985 and the grid reference (which seems inaccurate when the location is viewed) places it firmly in South Yorkshire. 59.033/1610 Euphydryas aurinia Marsh Fritillary (Rottemburg, 1775) ... Carr lists it as 'very rare' in his book, but we doubt the validity of both records, or that this species even occurred naturally in the county at the time. Carr states that 'according to Sterland, it was taken several times in Sherwood Forest by J. Trueman' (1899) and then lists another record by Miss Alderson (later to become Lady Robinson) who captured a specimen at Worksop in 1883. 61.003/1556 Thecla betulae Brown Hairstreak (Linnaeus, 1758) ... There are no historically documented records of this species ever having occurred in the wild state in Nottinghamshire. There are however, four post-1980 records which we have been able to trace and all four relate to the release of captive bred stock into suitable habitat. One is a claimed record listed in the Database of the Derbyshire and Nottinghamshire Entomological Society (DANES), from Sherwood Forest Country Park in 1982 (Elliot, B.). We came across the record a number of years ago, when researching records for a number of publications on Sherwood Forest invertebrates. There is little Blackthorn on site and the actual location of the record (if the ID was indeed correct) may have been bordering the Country Park and opens fields north of Edwinstowe. The other three remaining records are probably more interesting and two are certainly unusual in their dates, leading us to be absolutely certain about there being an attempted introduction at this site. The more interesting records are from Duke's Wood and/or Dilliner Wood on 26/01/2005 and 11/04/2005. Both records would refer to eggs, which no local naturalist would ever be likely to consider looking for in Nottinghamshire. The third record would refer to at least one adult Brown Hairstreak, with the record coming from the same general area of Dukes Wood and/or Mansey Common on 31/08/2005. There are no other reported records, although we are aware of a potential release of captive stock at woodland in the Southwell area a few years ago, but have no further details. 61.010/1569 Cupido minimus Small Blue (Fuessly, 1775) ... It is doubtful that this species ever occurred naturally in Nottinghamshire. Carr quotes from William Howitt's 'Book of the Seasons' in which he claimed it 'was infrequent in Nottinghamshire', yet Carr states that 'no entomologist has noticed it in the county'. 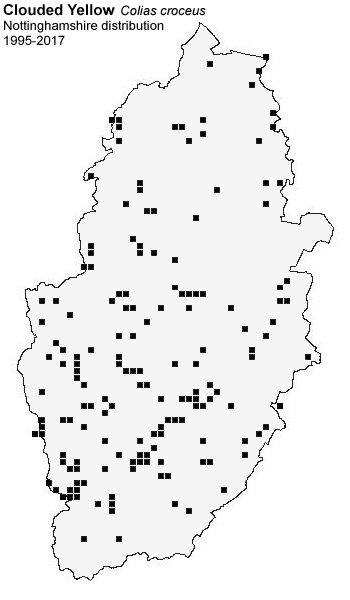 There have been few county species lists published over the years. The last was 'A checklist of the Lepidoptera of Nottinghamshire' compiled by Ken Cooper and Sheila Wright in 1993, which was the first since Carr's 1916 book 'The Invertebrate Fauna of Nottinghamshire' published by J.& H. Bell Ltd, Nottingham. Producing a reliable species list can easily come down to personal belief, so we have had to give careful consideration to potentially suspect records, rather than just trusting a particular recorder's identification skills. J.W. Carr certainly had his preferences for whom he believed in and we feel he was justified to do so. So many of the county's historical lepidoptera records (including moths), lack basic details such as date, location, an accompanying specimen, or supporting notes and it is unlikely that they would be accepted today. There were (and still are) obvious mistakes in identification, but hopefully we have filtered out the dubious records to produce what we think is an accurate and reliable species list of those butterflies which have occurred in a wild state in Nottinghamshire. 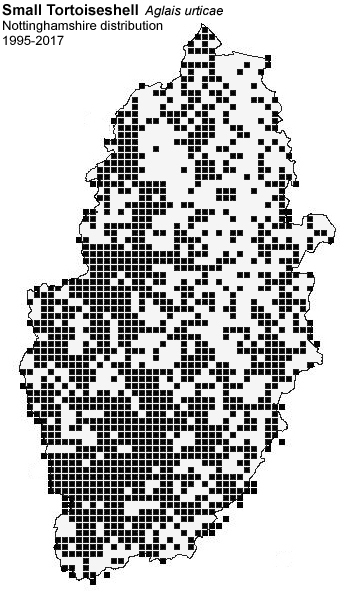 Species shown with a red asterisk* are known from historical records only, having produced no post-1960 county records. 57.006/1526 Thymelicus sylvestris Small Skipper (Poda, 1761) . Five species known from Nottinghamshire, with stable populations of Small Skipper and Large Skipper. 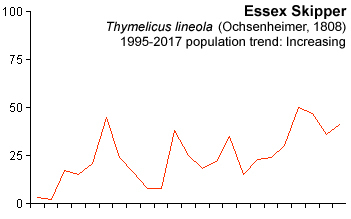 Colonisation of the county by Essex Skipper occurred in 1995, followed by northerly range expansion throughout the county. On-going increases of range currently being shown by both Dingy Skipper and Grizzled Skipper over the past couple of decades. Historical records: Initially described by Carr in 1916 as being 'local and rare' and then goes on to say that 'it was taken near Mansfield in 1859 and 1860 (Brameld). From the Mansfield district, it was fairly common in Spring', with Carr giving May 1893 given as a particular example. Carr also states that specimens were occasionally taken in the Autumn, so was obviously referring to an occasional and partial second brood in warmer years. After initially describing Dingy Skipper as being 'local and rare' in 1916, nearly twenty years later, Carr is more positive on its status within the county, stating that 'this butterfly seems to be increasing its numbers in Notts'. He adds that 'Mr Crossley reports it as abundant about Cotgrave from 1920 to 1923 and I have seen it in some numbers in several localities near Owthorpe in late May and early June 1925-1926'. Carr then adds a final record from Wigsley Wood in 1934. Current distribution and status: Previously very scarce, bordering on very rare in Nottinghamshire. The Dingy Skipper has rapidly increased its range since 2003, utilising the remaining network of former mineral railway lines to spread eastwards across the county. Now found at most (if not all) of the county's former colliery sites including Annesley, Annesley-Bentinck, Bestwood, Bevercotes, Bilsthorpe, Calverton, Clipstone, Crown Farm, Gedling, Linby, Newstead, Ollerton, Rufford, Shirebrook, Silverhill and Warsop Main. Prior to 1995, the Dingy Skipper was known only from sites at East Leake and along the Teversal Trail, but in 1997 it was found for the first time close to the Derbyshire border at Bennerley Marsh. This represented only the third known locality for Dingy Skipper in Nottinghamshire, and it has since gone on to dramatically increase its range eastwards across Nottinghamshire towards the Trent Valley. 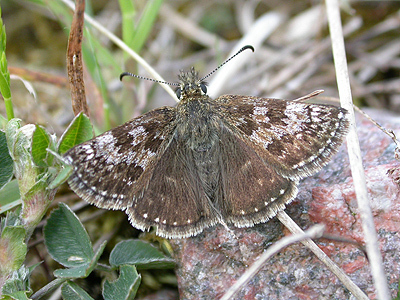 The Dingy Skipper first showed a pronounced population increase in 2010, when there were rises in both the number of reported records and sites across the western-half of Nottinghamshire. Two less productive years followed, before a huge increase in records occurred in 2012 and another more recently in 2017 following two less productive (but still historically notable) years. There is no doubt that the Dingy Skipper's success has coincided with the demise of the county's coal industry and possibly the increased frequency of much milder Winters over recent years. The butterfly's liking for brownfield sites left after the cessation of coal production, seems in part, to rely those sites having areas which have not been landscaped and grassed over. The Dingy Skipper shows a clear preference for areas where the vegetation is sparse and Bird's-Foot Trefoil has been allowed to develop naturally at such sites. At the former Gedling Colliery (now a country park) Dingy Skipper can be found in small, clearly separated colonies at the base of the former colliery's south-facing spoil heaps. In a 2016 survey, we found the greatest concentrations of Dingy Skippers to be where Bird's-foot Trefoil was growing in areas where the grass and other vegetation was short, or still sparse and where some scrub provided shelter and they particularly favoured available hollows, banks or dry ditches. The survey produced a minimum total of 32 Dingy Skippers on 19/05/16, with the strongest populations being found along the bank and drainage ditch, directly above two shallow lagoons. Another good population was found on disturbed ground close to the site's Methane Plant. Just one Dingy Skipper was recorded from the same survey area in 2014, which provides an indication at how quickly the butterfly can establish itself at a site. Flight period: Although there are several April records with April 18th 2017 being the earliest county record, the Dingy Skipper's main flight period is during May and continuing into June with numbers becoming less. The latest date for Dingy Skipper in Nottinghamshire is July 7th 2013. Historical records: Listed in Carr's book as being 'local and rare, except in localities south of Nottingham. In terms of actual records, he lists Grizzled Skipper from 'Newstead 1883 (Wright) and being occasional at Southwell, Wellow (Becher) and Langford Moor. It was often and common on the Fosse Road (the A46) and lanes about Cotgrave, Owthorpe and Widmerpool. Further quoted sites includes Bunny Wood, Plumtree, Gotham and West Leake Hills (Carr) and from Oxton and Epperstone' (Saunt). Later records listed by Carr in the 1935 Supplement to his original book, gives several later records and states that Daws recorded it 'in fair numbers near Mansfield in 1920'. We believe that the location may relate to Theives Wood, as most of Daws' records seem to originate from either there, or Harlow Wood. Other records from Carr's Supplement include Roe Wood, Winkburn, where it was 'rather common in May 1922 to 1925' and Borders Wood Owthorpe in June 1925. Current distribution and status: Another butterfly which has increased in the county in recent years, largely through the efforts of volunteers carrying out scrub thinning work along disused railway lines in the south and south-east of Nottinghamshire. The main areas of occurrence are along disused railway lines running from East Leake north to Rushcliffe; along the Bingham Linear Walk from mid-way between Langar and Plungar north-west to Bingham and Saxondale and from Staunton northwards past Cotham towards Newark. 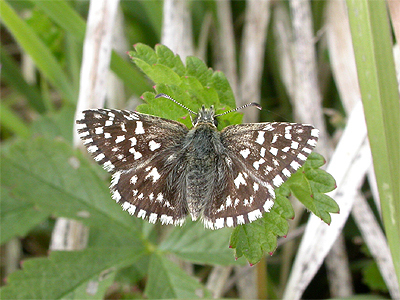 In 1995, the Grizzled Skipper was known from just three Nottinghamshire tetrads. This increased to ten the following year, when there were additional records from East Leake, but also from new sites at Barnstone and further north along the same disused railway line at Saxondale. 1996 also saw the first of a number of records reported from along another former railway line at Kilvington and Cotham. 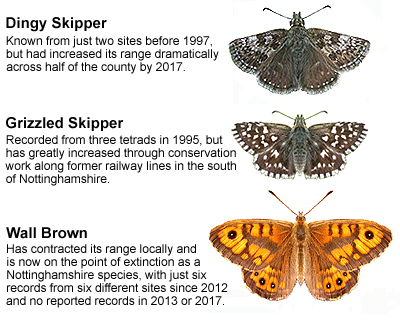 So by 1997, Grizzled Skippers were now appearing to rapidly colonise Nottinghamshire via three former railway lines. Remembering that at the time (and with Grizzled Skipper still being a rare and relatively new butterfly to Nottinghamshire) the rate of spread along the three former railway lines, may have been slightly distorted by the suddenly increased number of recorders trying to see Grizzled Skipper in the county for the first time. In 1997, there was a small but notable peak in the number of records provided to the county recorder, before the number of records gradually dropped, leading to an apparently blank two year period in 2007 and 2008. Since then, the Grizzled Skipper has generally done extremely well, although it seems prone (as do most species) to occasional bad years following several years of relative abundance. Bad years are most probably influenced by climatic conditions and 2016 seems to have been a good example in which Grizzled Skipper numbers were poor. There is a cluster of records from the recently created Newstead and Annesley Country Park in the west of the county. At the time of writing (early April 2018) this remains the only former colliery site on which Grizzled Skippers have been recorded. They were first noted in 2005, but then not seen again until several reports in 2013, but apparently not since. These sightings would possibly indicate two attempts at captive-bred releases. Relatively near to Newstead and Annesley Country Park, there has been a claim of Grizzled Skipper from the Kingsway Park area of Kirkby-in-Ashfield. However, the record is dated as July, which is really too late for Grizzled Skipper and has to be questionable, as perhaps do two other records from the north of the county. 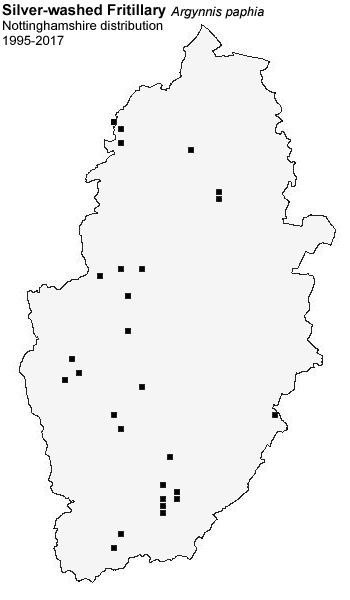 Single records from Parish Park Reserve (part of the Lound GP complex) in 2014 and Shireoaks Woodlands (the former Shireoaks Colliery) in 2015, are both isolated occurrences, coming well away from any of the county's other Grizzled Skipper sites. Grizzled Skippers arising from released stock is also a possibility for both these records, but they could relate to genuine occurrences. Misidentification with the day-flying moth Latticed Heath (Semiothisa clathrata) is unlikely and certainly the recorders of the Parish Park record were certain of their original identification. Flight period: The earliness of the flight season is totally dependant on the Spring weather, but the first Grizzled Skippers usually begin to appear from the last week of April. May is the main flight period and the season is largely over by mid-June. Historical records: A century or more ago, this butterfly was still found in Lincolnshire woodlands, just over the border from Nottinghamshire, when Carr produced his book 'The Invertebrate Fauna of Nottinghamshire' in 1916. In his brief account of this butterfly, he mentions 'that there is no trustworthy record of its occurrence in this county'. However, it was apparently present in Wigsley Wood in 1934, when Carr produced the supplement to his original work in 1935, writing that 'the first authentic Nottinghamshire specimen, was taken at Wigsley Wood on June 5th 1934 and on June 10th. About a dozen specimens were seen in the same locality' (Carr and Jones). 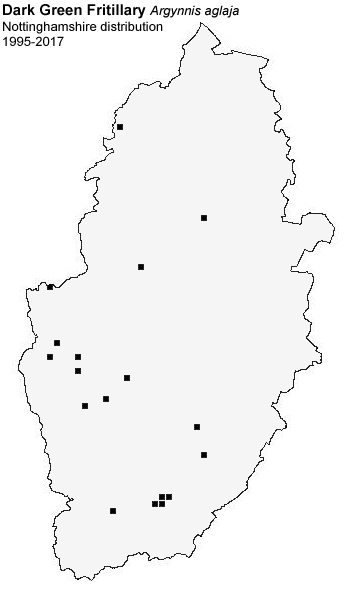 Current distribution and status: The Chequered Skipper does not occur in Nottinghamshire and has long been extinct. The 1934 Wigsley Wood record is believed to be the last known, or published Nottinghamshire record. Historical records: Very similar in appearance to the Small Skipper and, because of this similarity, the Essex Skipper was not officially recognised as a separate species until 1889. There is a single record listed by Carr, of a specimen taken by Mr J.N. Young in 1880 at Clumber. Carr obviously had his suspicions regarding the validity of the record and went on to add that 'it seems strange that none of our local collectors have taken this species'. Current distribution and status: Following a dramatic expansion of its UK range, the Essex Skipper was recorded as being new to Nottinghamshire in 1995, when found at Colwick Country Park (Walker, M.). In 1996, it was recorded across the River Trent from Colwick at Holme Pierrepont, before a more widespread set of Essex Skipper records came from new sites at Bingham, Carlton and Granby, in addition to further records from both Colwick Country Park at Holme Pierrepont. 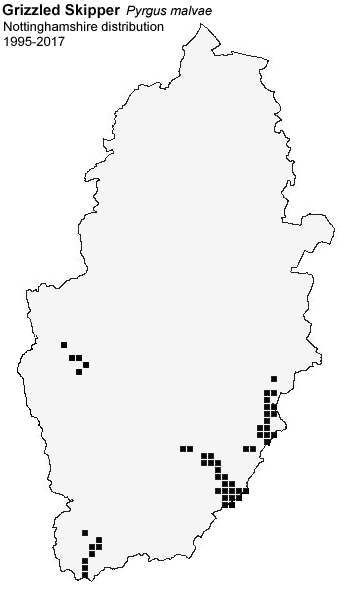 The butterfly's range expansion into Nottinghamshire from the south-east continued and by 1998, it had reached as far north as Girton, Langford Lowfields and Spalford Warren north of Newark. Such an expansion of range is hardly likely to have occurred within a single year and it is probable that it had been previously overlooked by recorders. 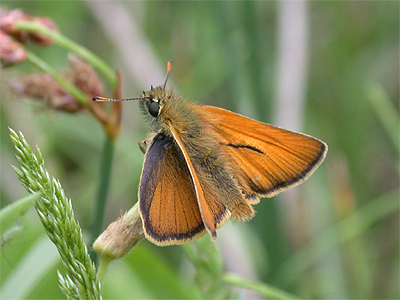 By the end of the 1990's, the Essex Skipper had successfully colonised much of south-east Nottinghamshire, but its spread across the middle of the county, did not become apparent until 2003/2004, when it reached Budby, Warsop Main and Annesley Pit Tops, Eakring, to as far west as the Teversal Trail on the border with neighbouring Derbyshire. Towards the north of the county, it was now found well past Newark and had reached Daneshill Lakes north of Retford. Becoming progressively commoner since its first appearance in Nottinghamshire, the Essex Skipper now has a population of around 50% that of the Small Skipper at many sites. With identification between the two species largely relying on the underside of the antennal tip being back (as if dipped in black ink) the butterfly is probably still under-recorded to a degree. 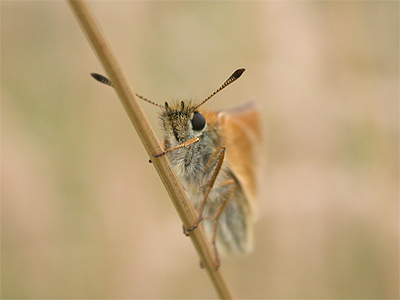 Now almost 25 years since it was first discovered in Nottinghamshire, the Essex Skipper has become a widespread butterfly of many grassy sites. 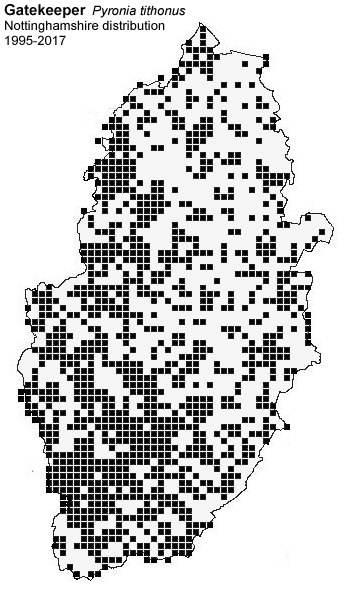 Roadside verges, post-industrial brownfield sites and the county's former Collieries, all provide ideal habitat and although the distribution map shows a county-wide distribution, there are areas of largely agricultural land, that are apparently devoid of any records. Flight period: Not usually found much before the last week of June, with a pronounced peak reached during July and continuing until around the middle of August. There is an unusually late date of September 15th 2012, from the site of the former Calverton Colliery, which is considerably later (about a month) than any other date for Essex Skipper in Nottinghamshire. Historical records: Over a century ago, the Small Skipper's distribution seemed split between north and south Nottinghamshire and it was obviously not as evenly distributed as it is today. 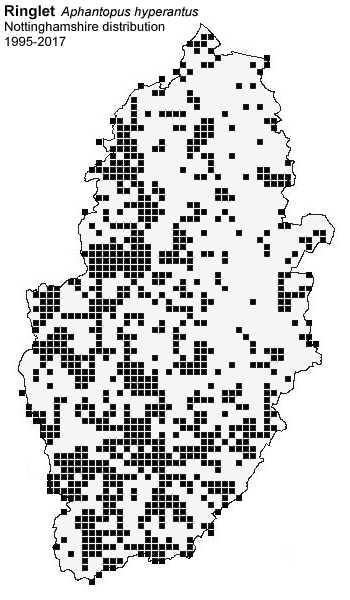 Carr listed it as being 'widely distributed and often occurring abundantly in the south of the county, but more sparingly in the north'. He then goes on to state that it is 'not common in the Worksop district (Lady Robinson) and only found 'sparingly' at Ollerton and Clumber Park (Leivers). Common some seasons in the Mansfield district (Daws) and common and abundant at Langford Moor, East and West Leake, Gotham, Bunny, Widmerpool, Wysall and Cotgrave'. Current distribution and status: At some time since Carr's 1916 book ' The Invertebrate Fauna of Nottinghamshire' and the follow-up Supplement to his original publication in 1935, the Small Skipper increased its range to become a common and familiar butterfly across the entire county. There does seem to be a slight westerly-bias to the county's records, but this may be driven by observer coverage. 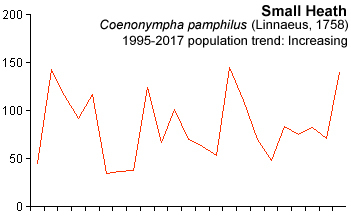 While it is still common today in areas of long grass, there is evidence of a gradual decline in the county's Small Skipper population since 1995, although this may be levelling off. In 1999, we recorded what we (at the time) deemed to be a catastrophic drop in Small Skipper numbers from all sites in the Eakring area, although it seems that no similar drop in numbers was noted elsewhere in Nottinghamshire. The number of records sent to the county recorder was actually one of the highest in recent years, but ultimately marked the beginning of the butterfly's apparent decline. The fall in the numbers of Small Skipper at Eakring occurred after it had still been noted as being abundant in areas of long grass the previous year, when all suitable sites in the area typically held good numbers. The same sites were checked frequently during 1999, but only a single adult was found. It eventually took a few years before there was any real return to its former numbers or status. The cause still remains a mystery, but the fact it apparently disappeared from only the Eakring area in 1999 and nowhere else in Nottinghamshire, would indicate some localised contributing factor, with pesticidal spray-drift, or parasitisation perhaps being the most likely. 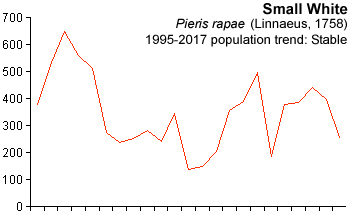 Years in which the number of reported Small Sipper records was higher than average were 1996, 1999 (in contradiction to the numbers found at Eakring) 2003, 2004 and 2009. 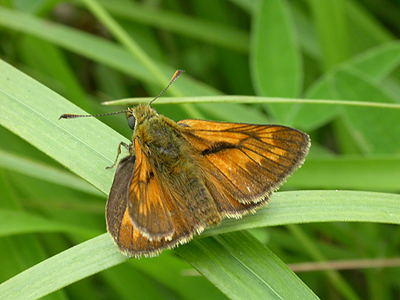 Flight period: The Small Skipper's main flight period is during July and continuing through much of August. The first butterflies are usually noted from the end of June and there are occasionally very late records in September, but such instances are rare and the flight season is usually well over by the end of August. Historical records: Historical records: Even in Carr's time, Large Skipper was 'widely distributed and locally abundant' although it was apparently 'not common' in the Worksop district (Lady Robinson) and only 'sparingly' in Sherwood Forest (Leivers). Current distribution and status: The Large Skipper is still a common and widespread butterfly over much of Nottinghamshire and another species with records showing a slight westerly-bias, which may be the result of recorder coverage. Although it is never found in numbers at any single area, the Large Skipper occurs widely on various brownfield sites, along woodland edges and woodland rides, in grassy meadows and roadside verges. Occasionally, they often appear briefly in urban gardens, where they visit nectar-bearing flowers. The Nottinghamshire Large Skipper population has remained relatively stable, but there has been a slight drop in numbers since the turn of the present century. This interestingly coincides with a similar drop in Small Skipper numbers and although there were just 29 records in 2007, Large Skipper numbers have increased again and at a faster rate. Present population levels have almost returned to near those found during the mid to late-1990's. There have been few notable peaks in the numbers reported, but the Large Skipper experienced good years in 2000 and just over a decade later in 2011. 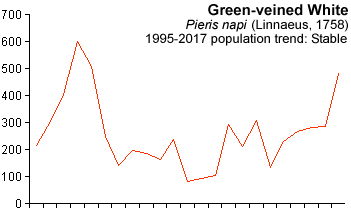 Flight period: The first butterflies are often recorded during the last week of May, but emergence from the first week of June is slightly more usual. Very early first dates occurred on May 14th 2001 and May 19th 2013, when there were no further reports until June 12th. A clear peak in numbers occurs throughout June until mid-July, after which there is a decline in numbers. There are a good number of August records, but one from Newark on September 16th 2003 is extremely late. Seven species recorded from Nottinghamshire, of which five are extremely common resident butterflies, which had good years in the late 1990's (especially in 1998) but have seen decreases in their reported numbers until signs of recovery in the last few years. Clouded Yellow and Pale Clouded Yellow are purely migratory visitors to Nottinghamshire, although Clouded Yellow is the only regularly recorded one of the two and just about annual. There appear to be no recent, or acceptable records of Pale Clouded Yellow. Sterland's record of a Black-veined White taken by J. Trueman, was felt to be unacceptable by Carr back in 1916 and on the basis that there was no actual site or date attributed to the record, it is best ignored as a Nottinghamshire butterfly. Historical records: Carr states that it was 'universally distributed in the county and in some seasons very plentiful', frequenting the country lanes and wood ridings. Current distribution and status: There seems to have been no real long term change to the status of the Orange Tip in Nottinghamshire over the past century and this delightful butterfly is still one of our most widespread native species. Perhaps only rivalled by the first male Brimstone of the year, the sight of the male Orange Tip flying along a woodland ride or hedgerow, is the surest sign of Spring to many people. And perhaps because the two species are so easily identifiable, they are two of our most frequently recorded butterflies. All our native butterflies are prone to fluctuations in their numbers on an almost annual basis. 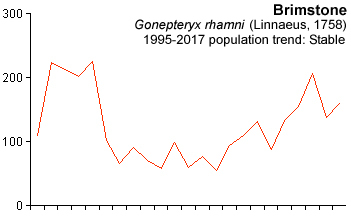 But while the number of Nottinghamshire's Orange Tip records, do show a considerable drop after peaks in 1997-1999 and most recently in 2017, the annual variations in numbers are once again matched in their similarity to those of the Brimstone, showing limited variation to most other species. Of the other Pieridae the Green-veined White has also showed a similar drop in numbers since 1998 and is another butterfly presently on the increase, but one which has shown greater variation in the number of reported sightings each year. The Orange Tip is common and widespread across the whole of Nottinghamshire and it certainly should be expected to occur within many urban areas. In fact, we would suggest that sightings from parks and gardens have probably increased since the early 1980's, which shows up in the above distribution map as discernable band of records running across more northern parts of Nottingham itself. The patchiness of its distribution across the county, is likely to be the result of restrictions in recorder coverage, rather than being a natural feature of the Orange Tip's distribution. A slight thinning in the number of records from north-eastern parts of Nottinghamshire (including parts of the Trent Valley), is probably due to the lower levels of human habitation and lower levels of recording. Flight period: The Orange Tip is typically found on the wing from late March or early April. The earliest first date since 1995 is March 17th 2011, but some ten years earlier, the first was not seen on the wing until April 25th. 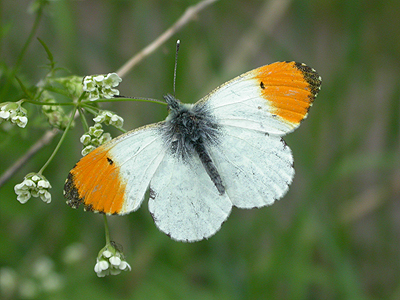 2013 was another late year, when the first Orange Tip was not reported until April 24th. Depending on the lateness of the Spring, peak numbers occur from late April and throughout May and June, with butterflies continuing to be found until the middle of June after prolonged, cool Springs. Historical records: Carr generalises his 1916 summary of the Large White, simply stating it to be ' very plentiful in all parts of the county, but in some seasons rather scarce and that the Spring brood seems to be usually the larger in point of numbers'. He then goes on to record that the earliest and latest dates were March 23rd and September 10th. Current distribution and status: Writing a summary for the Large White just over a hundred years later, would seem (on the face of it) to be just as easy as Carr had found it to be. Not much appears to have greatly changed regarding the butterfly's present status in that time and the Large White is indeed, still a very common butterfly with a widespread distribution. An often severe pest of Cabbage crops, the number of modern Large White records suggests that the second (Summer) brood is actually around four times greater now than the Spring brood, something which certainly seems to have changed since the early 1900's. 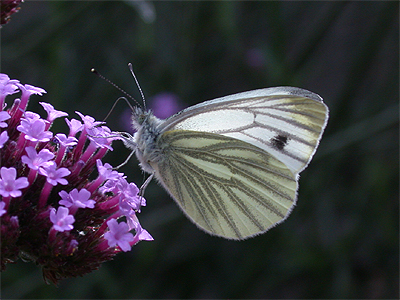 Nottinghamshire's resident Large White population had good years in 1998, 2005, 2011 and 2015, but suffered an especially poor year in 2007 when there were just 76 reports. The overall population trend is stable, despite a drop in numbers after 1998. Once again, the greater number of Large White records originate from the more densely populated areas of the county, especially from south of Nottingham, up through Bestwood, Ravenshead and through the Mansfield and Ashfield areas to Worksop. Migration: Far less well known for its migration tendencies than either the Red Admiral, Painted Lady or Clouded Yellow, a number of migrant Large Whites reach the county most years. These probably originate from southern Spain as they tend to arrive in conjunction with large numbers of Painted Ladies. There appears to be no information regarding the migration of butterflies (especially Large White) through Nottinghamshire and so we have had to resort to our own data from 2003 and 2009. Both years saw large-scale Painted Lady movements through the county and Large Whites were recorded moving through Eakring in August 2003, during a period of very hot weather. The largest recorded movement was of 179 Large Whites south-west on August 3rd, followed over the next few days by 36 south-west on August 4th and then eight south-west on August 6th. 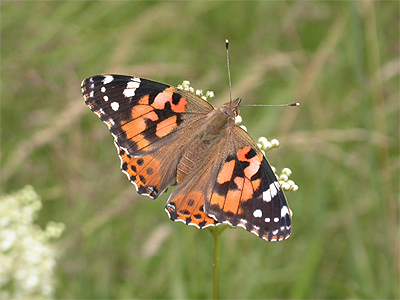 Movements coincided with large numbers of Painted Ladies moving through at the same time, but a surprising range of other species were involved. Probably as a direct result of immigration earlier in Spring 2009, Large Whites were abundant in what was generally a good year for many of our native butterflies. Several counts of 500+ Large Whites were made throughout the Eakring area during July, but some genuine movement consisted of 109 moving south-west with Painted Ladies on August 9th 2009. Flight period: There are certainly two broods each year and occasionally a third. Butterflies are recorded from early April, or late March onwards. The Spring brood is on the wing throughout April, May and well into June and it is often difficult to determine the limits of each brood. The Summer brood produces a much larger peak in numbers during June and July, with probable third brood (or migrant) Large Whites being found commonly in September and often well into October. Carr thankfully offers us the chance to make a direct comparison with the Large White's earliest and latest records over a century later. Up until the end of 1916, he states that the earliest and latest dates for Large White in Nottinghamshire, were March 23rd and September 10th respectively. Unfortunately he fails to mention the years each date refers to, but it still allows us the opportunity to see if the Large White is emerging earlier now than it used to. Between 1995 and 2017, the earliest and latest dates were March 22nd 1998 and November 2nd 2010 respectively. This means virtually no difference between the Large White's earliest emergence a century later, but would indicate a significant difference in the butterfly's latest date. It seems (on the face of it) that the Large White is flying much later now, than it did when Carr, Brameld and the rest, were doing their recording in the late 1800's. It is likely that there are now regularly three broods, when there used to be only two. Out of the past 23 years (to 2017) the Large White has been recorded flying well into October on an almost annual basis, but only October 28th 2009 and October 29th 2006, come close to the latest ever recorded date of November 2nd 2010. Historical records: Even over a century ago, this butterfly was described by Carr as being 'abundant throughout the county' and provides the earliest and latest dates of March 20th and October 1st. Current distribution and status: One of our most common and widespread butterflies and another butterfly pest species of Cabbage crops. 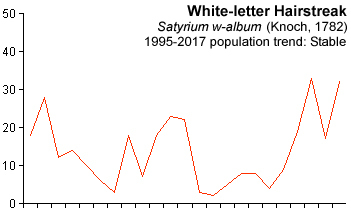 The late 1990's saw several years of relative abundance when the Small White was extremely common and there were many reported records. From the start of the present century, there has been quite a considerable drop in the number of records and it is difficult to tell whether the late 1990's peak, was an isolated occurrence following a gradual build up of numbers over a number of years. Lowest numbers came between 2006 and 2008, but there has been something of an increase since then. The Small White seems susceptible to wide-ranging fluctuations in population levels and since 1995, drops in the number of reports have followed good years. Aside from climatic conditions, the most likely causes for reductions in numbers would be larval parasitisation and pesticidal use. Currently, Nottinghamshire's Small White population remains stable. Flight period: Once again, Carr published the county's earliest and latest dates for Small White, although he omitted the respective years. Up to and including 1916, the earliest recorded date was March 20th and the latest was October 1st. A hundred years on, these earliest and latest dates compare to post-1995 dates of March 17th 2013 and October 14th 2017 respectively. Once again, the earliest date is virtually the same now as it was then - just three days earlier. That's not really much of a difference considering how our climate appears to have changed over that time and the Small White is only flying a little later now than it once did. The latest post-1995 date of October 14th 2017, is just two weeks later than that listed by Carr in 1916. The first Small Whites appear around mid-April, but late March is not uncommon and there is considerable variation between first dates. There are certainly three broods in favourable years and determining the start and end flight periods for each brood is difficult as there will be overlap. The Spring brood generally peaks around the middle of May and continues to fly well into June, with the second (larger) Summer brood peaking in July and August. Small Whites remain reasonably common well into September (likely third brood) and there are numerous October records. Historical records: Historically, this butterfly was 'distributed throught the county in most districts as commonly as P.rapae' according to Carr. 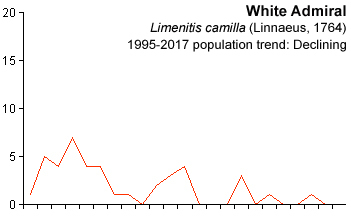 Current distribution and status: The Nottinghamshire status of the Green-veined White has showed no real change over the past century. It is still one of our most common and widespread butterflies, being found in a broad range of habitats, but the distribution map indicates that it is slightly less often recorded than the Small White. 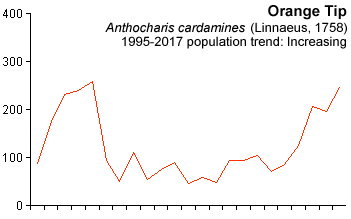 There is quite a great deal of annual variation in numbers and the graph below is remarkably similar to that of the Orange Tip over the same time period. It shows an extremely pronounced peak occurring between 1998 and 2000, before decreasing numbers led to poor years between 2001 and 2012. This poor run was broken only by small peaks in 2009 and 2011 and there has been some signs of a recovery in the past few years. The number of records in 2017, was almost as high as those reported in 1998. Flight period: There are typically two broods, but often a third in warm years. The Spring brood peaks in May and continues into June, with the second (Summer) brood peaking from mid-July to mid-August. Butterflies continue to be found throughout September (third brood adults) and there are a good number of October records. The first butterflies are usually on the wing from late March or early April and there has been considerable variation on the date when the first butterflies have appeared over recent years. March 12th 1997 still remains the earliest date for Green-veined White in Nottinghamshire since 1995, but other early records occurred on March 13th 2003 and March 16th 2014. By contrast, no Green-veined White was recorded in the county until April 28th in 2006 and April 24th 2013, but these are extraordinarily late first dates. Historical records: A migrant species, which reaches the southern counties of the UK each year. Historically in Nottinghamshire, the Clouded Yellow was of more frequent occurrence than the Pale Clouded Yellow, even at the turn of the 1900's. Carr mentions that 'the Clouded Yellow could be uncertain and erratic in its appearance in Nottinghamshire'. He goes on to state that 'it was recorded in good numbers in 1892 and then in considerable numbers in 1900'. Carr goes on to relate that 'on the Fosse Road near Cotgrave, it was so abundant that Mr A. Simmons captured 50 specimens in perfect condition in two hours'. Carr subsequently listed an additional record in the 1935 supplement to his original book, stating that 'a female was taken on the Fosse Road near Cotgrave in 1922'. Current distribution and status: Carr's statement that 'the Clouded Yellow could be uncertain and erratic in its appearance in Nottinghamshire' still stands well in describing the Clouded Yellow's occurrences over a century later. It is still a reasonably uncommon and unpredictable migrant to Nottinghamshire, but has become an annual visitor since blank years in 1995 and 1997, just two reports in 1999 and only one in 2001. 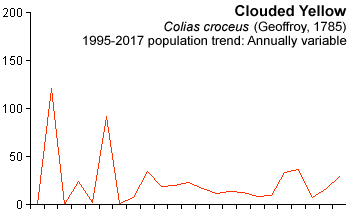 Only occasionally does the Clouded Yellow experience good years in which it is easier to find with a bit of effort, but the large influxes such as those of 1996 and 2000, appear to have become a thing of the past. Clouded Yellows occur almost anywhere and recent records are certainly spread across the length and breadth of the county. There is a slight southerly bias to the county's records and it appears to have a preference for more 'open' sites, but seems unlikely to visit urban gardens. Former colliery spoil heaps are often favoured sites and Warsop Main, Newstead and Annesley, Bestwood and Shirebrook, have all produced a number of records in recent years. The distribution map also shows a string of records running north-east up the Trent Valley away from Nottingham. This may be due to birdwatchers recording Clouded Yellows when they visit the numerous gravel pit complexes along much of the River Trent, but could show that butterflies will use river valleys to migrate northwards. This is certainly known to apply to migrant moths. Migration: Rarely recorded actively migrating through Nottinghamshire, but late butterflies do move southwards on suitable days, usually coinciding with movements of more familiar migrants such as Red Admiral and Painted Lady. 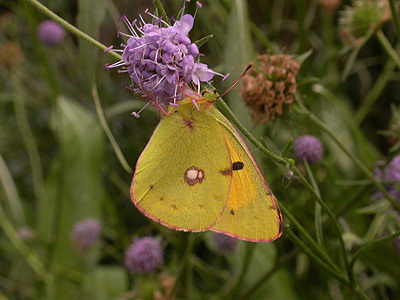 In over a decade recording the butterflies of the Eakring area between 1998 and 2010, Clouded Yellows were only recorded during the large influx of 2000 (four records) followed by a single record in 2004. All but one of these were adults observed on genuine return migration, involving butterflies actively migrating south. 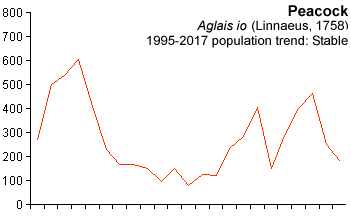 Flight period: Arrival can be expected from the middle of June in years of high migrant activity, but quite often the first reports don't come in until July or even August. The peak month for Clouded Yellow records in Nottinghamshire is August (see graph above right) and butterflies resulting from late arrivals can occur well into the Autumn, often remaining at a site for several days. Late Clouded Yellows can often be found well into October, but there are two November records, constituting Nottinghamshire's latest since 1995. These were November 9th 2006 and November 4th in 2014. Historical records: Nottinghamshire records apparently relate to before 1902. Carr states that C. hyale 'is usually very rare, but occurs in small numbers at wide intervals'. Sterland apparently recorded it several times from Sherwood Forest, but Carr goes on to list the following records, which are probably more reliable. The first dated record was from Nottingham in 1859 (W.H. Smith). This was followed by several in the Mansfield district in 1875 (Daws) and then three at Normanton near Southwell in 1877 (Rev W. Becher). Two were taken at Bestwood in August 1900 and four near Cotgrave the same month. There was an Upper Broughton record in September 1900 and the last record to be listed by Carr, was from near Plumtree in 1901. Historical records: Carr hints that the Brimstone was perhaps not as common as it is today. He states that it 'occurs somewhat sparingly throughout the county, but is occasionally quite common as it was in 1900, when it occurred throughout the length and breadth of Nottinghamshire'. Current distribution and status: This is one of our most familiar and readily identifiable butterflies, heralding the arrival of Spring for many recorders and indeed, is a true sign of warmer weather. Because the male is so distinctive and instantly recognisable, the Brimstone is also one of our better recorded species and the eagerness to record the first butterfly of the year, means we have an accurate picture of distribution. 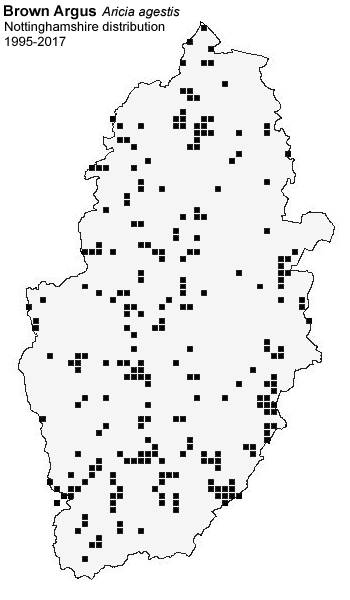 Based purely on Carr's statement that it 'occurs somewhat sparingly throughout the county, but is occasionally quite common as it was in 1900', then it would seem that Brimstone numbers have increased on those recorded a hundred years ago, or it is at least more widespread across the much of the county now than it once was. 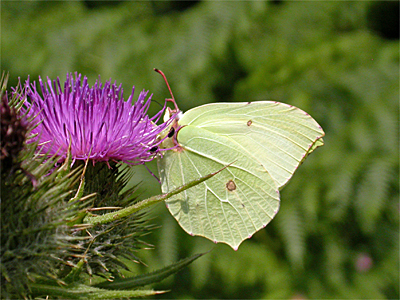 The Brimstone will often appear in gardens, though usually only briefly before continuing on, but it is more often to be encountered flying along country lanes, hedgerows and woodland rides. Males often range long distances locally and will turn up well away from the nearest Buckthorn (Rhamnus cathartica), which is not the most widespread of plants in Nottinghamshire and is usually only occasional within lengths of hedgerow or woodland edges. 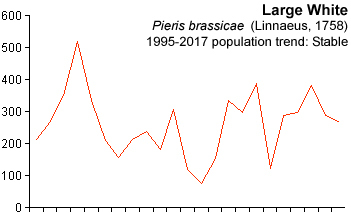 The pattern of rise and fall showed in the number of Brimstone records between 1995 and 2017; and its similarity to those of the Orange Tip over the same time period, is quite remarkable. Both species had good years in the late 1990's, before an obvious ten year slump in the number of reported records between 2000 and 2009. Since 2010, the Brimstone has undergone what looks to be a steady recovery in the county, attaining somewhere near the numbers recorded during the latter part of the 1990's. Flight period: Regarded as being one of the longest-lived of all UK butterflies, adults can occur in every month of the year, but they are rarely recorded from October to February. Overwintering takes place deep in the foliage of evergreen shrubs, with Ivy being a particular favourite and the first butterflies reappear on the first warm days of Spring, usually around the middle of March. Although a butterfly found throughout the year, the peak months are during April and May when breeding occurs, but late Spring adults can often be recorded on the wing well into June, even when the second brood is emerging. Second brood adults peak in late July and August, but Brimstones soon disappear and hibernation begins early. Few are recorded during the Autumn. 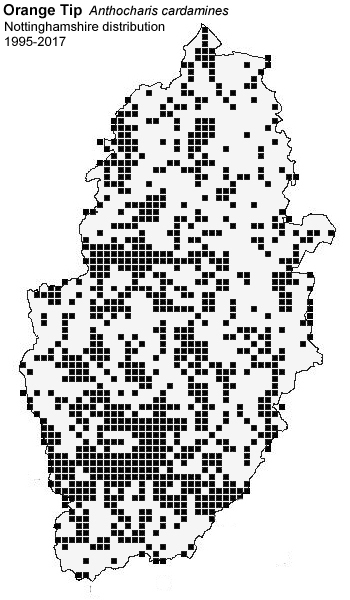 21 species known from Nottinghamshire, which have suffered widely varying fortunes over the past century or more. Most Nymphalidae are common residents and some of our most familiar and well recorded butterflies, but it may surprise some to read just how the fortunes of butterflies have changed and show that (in some instances) species declines are far from being a modern phenomenon. Pearl-bordered Fritillary, Small Pearl-bordered Fritillary, High Brown Fritillary, Large Tortoiseshell and Grayling, are all long since extinct in Nottinghamshire and Wall is seriously on the point of becoming lost as a breeding species and should be considered the county's most endangered butterfly. Red Admiral and Painted Lady are long distance migrants reaching Nottinghamshire in varying numbers each year, but there have been at least four Camberwell Beauty records in Nottinghamshire since the late 1990's. There have been a number of unofficial releases at several Nottinghamshire sites and whilst there is a currently successful Purple Emperor introduction at Cotgrave Forest, the White Admiral now seems to have died out in woodland near Retford. Some records of Silver-washed Fritillary and Dark Green Fritillary are also the result of released stock, but the scattered nature of a number of records of both these species in recent years, suggests some natural recolonisation or occurrence. Marsh Fritillary is listed in Carr's book, but we feel these records are either improbable, misidentifications, or both. We feel it is best ignored as a Nottinghamshire butterfly and should be left out of any county species list. Historical records: Described by Carr as 'another decreasing species', which may seem surprising to those who can remember how common this butterfly was in the 1970's and 1980's and who presume that all butterflies were in abundant supply a century or more ago. When Carr wrote his account almost two decades into the 1900's, at least two of his statements refer to the Wall Brown being much commoner a number of decades previously - statements that could easily refer to the butterfly's current status (2017). He listed it as 'occasional at Southwell 20 or 30 years ago; also at Ollerton (W. Becher, 1900) and plentiful at Cork Hill Farm near Southwell in the 1870's, but not seen since'. The Wall Brown was obviously not a common butterfly over a century ago, as Carr goes on to list most of the county's records individually. He writes that it was 'fairly common some seasons in the Mansfield district, taken in June and August 1896 (Daws). One specimen taken at Clipston near Plumtree 1893 (Leivers). One near Cotgrave (Wallis). Shireoaks 1899 (Houghton). Seen by Mr Leivers and myself flying commonly in the lanes about Wigsley snd Thorney on two dates in August 1900. One at Widmerpool August 1913 (Saunt) and one at Kingston-upon-Soar in August 1914 (Thornely)'. In Carr's 1935 Supplement, he lists some additional records, opening his short summary of the species with 'a few in the rectory garden at Fledborough' (Kershaw), before quoting E.L. Crossley, who said 'occurs every year on the Fosse Road near Cotgrave and Widmerpool'. Leivers then relates how 'a male of the Spring brood was seen in my garden several years ago and another in 1933, a strange place for this species'. Where his garden was we don't know and Carr does not refer to it, but instead ends with records from Wigsley and Thorney in June 1934 and Misson later the same year. Current distribution and status: Without any doubt, the Wall Brown presently represents Nottinghamshire's most threatened and endangered butterfly. It seems very strange to write such a sentence now (May 2018) when as a teenager in the early 1980's, I used to breed both Wall Brown and Speckled Wood in captivity for fun, before eventually concentrating on some of the rarer butterflies. To be honest at that time, the Wall Brown population of suburban Nottingham never needed augmenting by releasing captive stock, and it was impossible to see how the fortunes of the two species would go on to change so dramatically within the space of 20 or 30 years. You were hard pressed to find a Speckled Wood in Nottinghamshire in the early 1980's, yet it expanded its range beyond belief while the fortunes of the Wall Brown went in the opposing direction - and relatively quickly too. 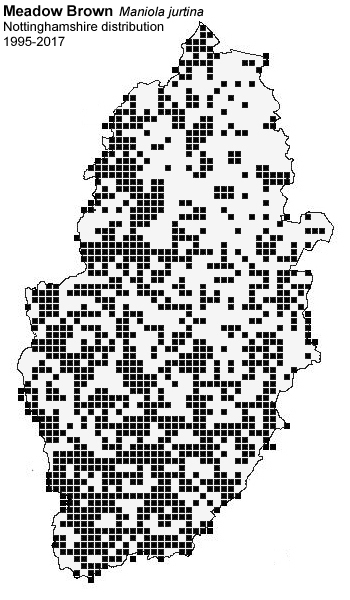 As its UK range diminishes, the butterfly's overall decline has been variously estimated to be somewhere in the region of 65%, but virtually all of the 1km grid squares in our distribution maps (and in which Wall Brown has occurred since 1995) show declines of 100%. Today, the Wall Brown has nationally contracted its range towards coastal areas and is on the point of extinction as a breeding butterfly in Nottinghamshire, with just five records from five different sites since 2012 and no records reported to the county recorder in either 2013 or 2017. 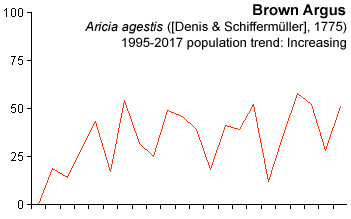 To the statistician, the Wall Brown's decline in Nottinghamshire makes interesting reading, as the number of sites and records each year since 1995 show that the butterfly's decline consists of three clear stages of troughs and peaks, with peaks interestingly occurring every six years in 1999, 2005 and 2011 and each peak being smaller than the preceding one. In what order the declines and troughs commenced we cannot tell, as the data only goes back to 1995, but it is probably safe to assume that these population swings have been going on for decades. The peak in Wall Brown numbers ended abruptly at the turn of the present century and as already mentioned, there have been just five records since 2012. Nottinghamshire's last record is currently from Cropwell Bishop in 2016. So what has happened? In 1999, Wall Brown numbers were at their highest over the last 20 or so years in Nottinghamshire, with 159 records reported from a total of 80 sites. This in itself had represented a huge increase on the 37 sites providing 101 records four years earlier in 1995. The number of records then dropped again to just 33 from 18 sites four years later in 2001, which is half of what it had been in 1995. That's certainly some fluctuation within the numbers of any population. Since 2005, the Wall Brown has been recorded from a total of 65 different Nottinghamshire sites, but with few sites reporting it annually for any number of years. In fact, the butterfly seems to have had a rather transient existance, rarely being recorded from a single site for anything longer than two or three years. A general tidying up of our towns and cities, the over use of herbicides and the development brownfield sites, have not been condusive to the needs of the Wall Brown and neither has the weather. The increased regularity of extremely wet months with over 100mm of rain during the breeding season may not have helped. 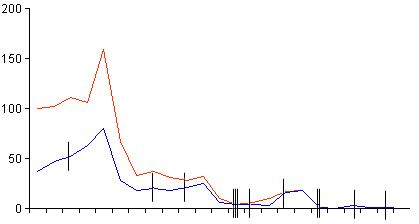 These are shown in the graph on the right as black vertical lines. The Wall Brown's three post-1995 peaks in 1999, 2005 and 2011, all came after drier Summers. 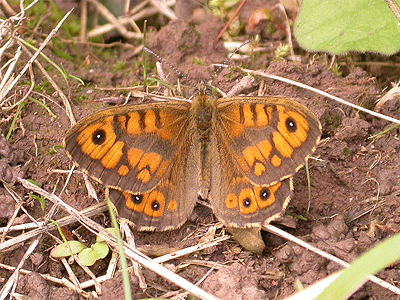 The site of the former Calverton Colliery and the neighbouring woodland of Watchwood, were the last sites in Nottinghamshire where it last occurred with any regularity, but the Wall Brown has not been seen there since 2009. Other regular sites and the years when it was last seen include Colwick Country Park in 2000, Bingham Linear Walk in 2006 and Misson in 2012. Flight period: There are two broods each year, with an occasional partial third brood recorded in the Autumn. The first adults are on the wing from around the second week of May and continue into June. First dates have ranged from May 2nd 1997 to June 1st 1996, but most have come in the first half of May. However, Wall Browns from the Spring brood have virtually died out and there has been just one Spring record since 2012 - at Cropwell Bishop in May 2016. The Summer brood is (or was) much larger than the Spring brood and virtually double the size flying from July and peaking during early August. Few second brood Wall Bowns have been reported in September, but there are a number of third brood from late September and early October from Nottinghamshire, most especially in 2003. Historical records: Stated as 'rare' by Carr, who mentions it as being 'recorded for Sherwood Forest by Sterland and Brameld and more recently taken from the Birklands by Hardy'. Carr adds additional records by mentioning that 'two specimens were taken in Drypond Wood, near Carlton-in-Lindrick about 1881 (Lady Robinson). From Mansfield in May 1888 and two in October 1889 (Daws) and a worn example was netted in Roehoe Wood, Widmerpool in July 1893 (Leivers). The only record Carr mentions in the 1935 Supplement to his original work, is 'one specimen from Rowhoe Wood taken by K.M. White in 1924'. 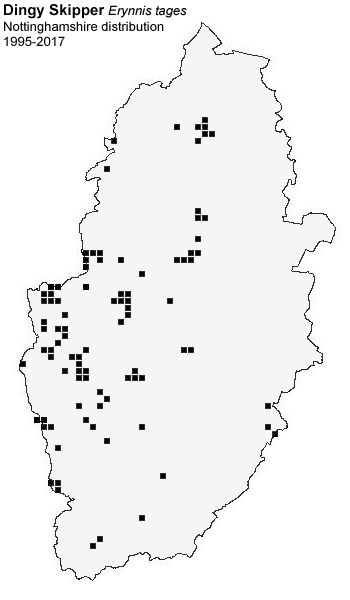 Current distribution and status: Although now one of our most common butterflies, the Speckled Wood was far from achieving that county status as recently as the early the 1980's. It's north-easterly range expansion through the county continued throughout the 1990's and during the opening decade of the present century and it is now widespread in western areas of Nottinghamshire. It's success has almost certainly been influenced by recent climatic changes, probably due to the mild Winters we now experience. Despite traditionally being a woodland species, the Speckled Wood has found its own niche in our parks and gardens and is now very much a butterfly of suburban locations. It can be expected to occur in many mature gardens throughout the course of a year and has effectively replaced the Wall Brown at many sites, particularly those in suburban areas. The distribution map shows how the greatest number of records have come from the Nottingham, Mansfield and Worksop areas, yet it seems to have failed to colonise the towns of Newark and Retford to anywhere near the same degree as those further west. The map also shows how the northern stretches of the Trent Valley are almost devoid of records, but we believe this likely to be due to this part of Nottinghamshire being more thinly populated and therefore less recorded. The number of annually accrued records has increased over the period 1995 to 2017, but not with the level of variation showed by some other butterflies over the same time period. There was something of a dip in numbers in both 2006 and 2007, but numbers have been considerably better since and are presently. more or less at the highest ever recorded in Nottinghamshire. Flight period: The Speckled Wood overwinters in either the larval or pupal stage (uniquely among UK butterflies), which leads to overlaps in the various broods occuring between April and October. Spring emergence is from late March or early April, and butterflies are on the wing almost continuously until well into the Autumn as a succession of broods. Numbers generally remain high from June to September with a definite peak occurring in August. Late Speckled Woods are often encountered in sunny situations on the last warm days of Autumn, sometimes remaining into November if the weather is suitable. Historical records: In his 1916 'The Invertebrate Fauna of Nottinghamshire' Carr gives only the briefest of summaries for this butterfly, simply stating it to be 'very common and universally distributed, especially abundant in the Sherwood Forest region'. 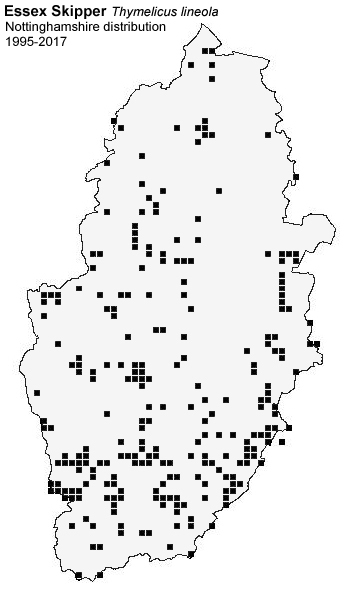 Current distribution and status: Whilst it remains widespread and relatively common over much of the county, the Small Heath has a decidedly patchy distribution. It generally prefers grassy sites on lighter soils and has certainly benefitted from the demise of the Nottinghamshire coal industry. 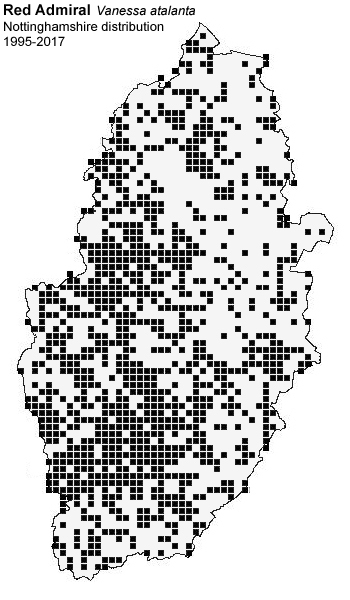 Its present distribution is more or less a map of the county's former Collieries, some of which are shown as an obvious line of clusters of 1Km grid squares running north-west to south-east through northern areas of Nottingham. The grid square clusters include the former Annesley-Bentinck, Newstead, Hucknall, Linby, Bestwood, Gedling and Cotgave Collieries, but the Small Heath has also utilised disused railway lines in the south-east of the county. Both Colliery spoil heaps and railway embankments, are ideal habitats and the Small Heath has proved adept at colonising them. Without any doubt, the Small Heath has been one butterfly to have benefitted from the habitats created as a result of coal mining and gravel extraction and its natural range in Nottinghamshire, has probably always been the heathlands of Sherwood Forest and Clumber, where it often occurs in small, discreet colonies and never in large numbers anywhere. Its hard to imagine the Small Heath as ever having been 'common and universally distributed in the county' as Carr stated, but he was probably more accurate about it being commoner in the Sherwood Forest area, as it is a butterfly preferring drier, free-draining soils. In modern Nottinghamshire, it is rarely a butterfly of agricultural land and has probably declined greatly from such habitat since the late 1800's and early 1900's. 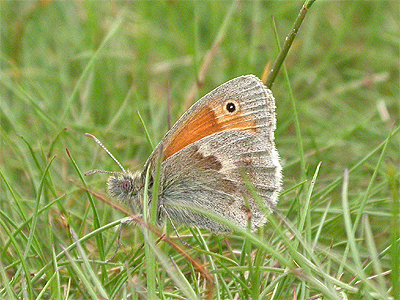 The Small Heath is one butterfly unlikely to benefit from small areas of habitat left in the corner of a field. It prefers more open and larger sites, so former colliery spoil heaps, restored gravel workings and railway embankments, have all played an important role in helping make this butterfly much better distributed in Nottinghamshire, than it is likely to have been in over a hundred years. The Small Heath's Nottinghamshire population showed a steady increase over the period 1995 to 2017, showing four obvious peaks during that time. It did well for a number of years in the late 1990's, before suffering poor years between 2000 and 2002. 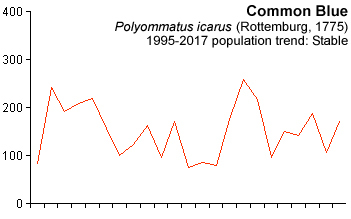 It should be noted that a number of other butterflies also experienced a post-1990's decline in numbers, but the Small Heath bounced back again in 2003 and has undergone similar periods of lows andsudden highs - the highs interestingly occurring about every seven or eight years. Flight period: The Small Heath can be found on the wing anytime between early or mid-May until mid-September and sometimes almost till October. Occasional, very early butterflies are often reported a good two weeks before the main emergence, with the earliest recorded Small Heath of recent years, being reported on April 12th 2014. This record is very early indeed and is the only Nottinghamshire record for April we are aware of. There are two broods per year and there appears to be some overlap of both to produce an extended season. A clear peak in numbers occurs in June, but numbers remain high throughout July, before decreasing during August and September. The latest county record appears to be October 1st 2015. Historical records: Described by Carr as being 'locally common in damp lanes and woods, but like so many of our butterflies, has disappeared from districts where it was formerly common'. He goes on to write 'about 1882 this species simply swarmed (together with Meadow Brown) in the grass ridings of Clumber and Welbeck Parks: since that time it has entirely disappeared from the neighbourhood' (Lady Robinson)'. Carr continues with 'Daws found it to be sometimes fairly plentiful in swampy situations in the Mansfield district, and in south Nottinghamshire it is common at Bunny Wood and about Widmerpool and Cotgrave, in the Owthorpe Woods, Clipston near Plumtree, East Leake and Gotham; also at Roehoe Wood, Winkburn and at Langford Moor'. 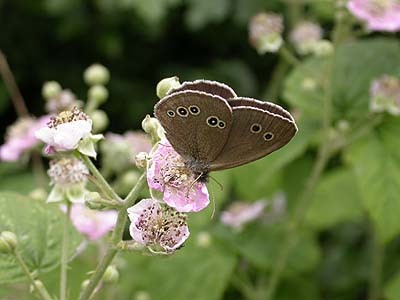 Current distribution and status: The Ringlet is a widespread and common butterfly of grassy sites, along woodland rides and edges, often preferring the more shadier areas than other species. It hasn't always been like this and its present status has been the result of a quite dramatic increase over the past number of decades, so much so, that it is now an occasional (but regular) visitor to many suburban gardens. Carr's comment that the Ringlet 'simply swarmed in the grass ridings of Clumber and Welbeck Parks' around 1882, and the accompanying comment from Lady Robinson that 'it had entirely disappeared from the neighbourhood' give us a good idea that huge variations in the Ringlet's population is indeed nothing new. As recently as the 1980's, it was not an easy find in Nottinghamshire (we actually knew of no local sites at the time) and when trying to obtain breeding stock of this butterfly, a visit to counties just south of Nottinghamshire was usually required. But there was a turning point in the Ringlet's fortunes during the mid-1990's, when it became much commoner and increased its Nottinghamshire range. 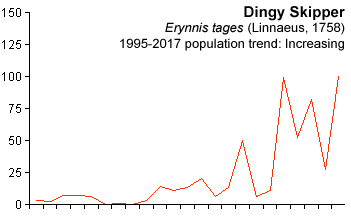 The number of records remained relatively steady during the opening decade of the present century, but it was in 2009 that Ringlet numbers started to increase, following a number of years where the population had remained static, yet above the level found in the 1980's. A good year in 2011 was followed by a short-lived drop in numbers and a relatively poor year in 2012, but the number of records has risen each year since, reaching a peak in 2017 - probably to its greatest level in more than a century. The Ringlet's increase means it has now surpassed the Meadow Brown at many sites, to become the commoner of the two species. 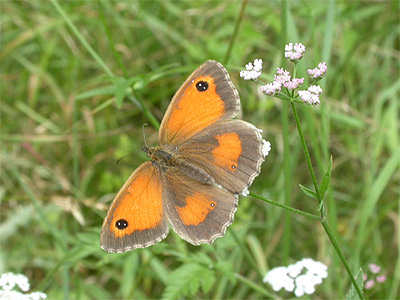 Both butterflies had a similar period of population stability throughout the early 2000's, but the Ringlet has since increased at a far greater rate than the Meadow Brown. Flight period: Adult butterflies are on the wing from mid-June, but there are a handful of records for May, which may or may not be spurious. 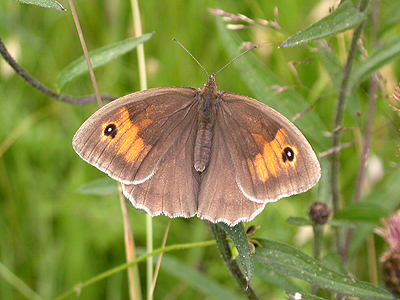 The date of the first Ringlet of the year, is often remarkably close to June 15th. Peak numbers occur throughout June and July, with numbers decreasing through August. Late butterflies remaining into early September are unusual, but not unheard of. Historical records: Carr states this species to be 'common and universally distributed in meadows and by roadsides, especially in quiet, grassy lanes. It is particularly abundant on the heavy Lias cllay soils of the southern part of the county, but appears to be losing ground in the Forest region of the north'. Current distribution and status: The Meadow Brown remains a common and widespread butterfly of grassy sites, along woodland rides and edges and roadside verges. 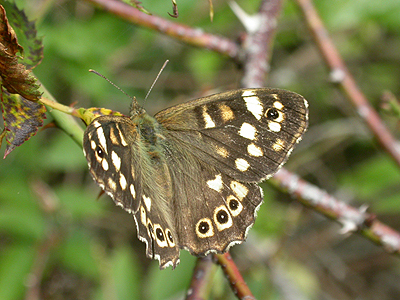 It is found throughout Nottinghamshire, with slightly fewer records from north-eastern areas of the county.Wandering individuals occasionally turn up in gardens if there is suitable habitat nearby, but it is not a regular garden visitor as Speckled Wood and Ringlet have become. 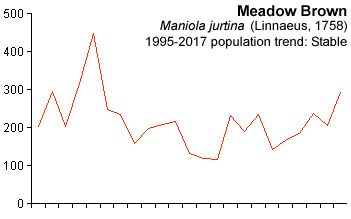 Apart from an isolated peak in 1999, the Meadow Brown seems to have retained a remarkably stable population since 1995. 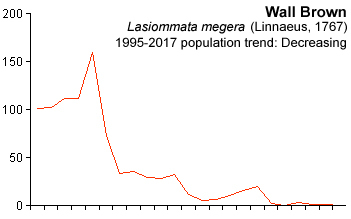 Most other butterflies had a good few years in the latter part of the 1990's, and although there was a slight decline in numbers between 2006 and 2008, numbers now seem to be showing a slight increase. Our own observations and records show something of a slightly worrying trend though, revealing that the Meadow Brown has now been replaced by the Ringlet, as the more common of the two species at many Nottinghamshire sites. In our minds, there is little doubt that the Meadow Brown is no longer present in the numbers found during the 1980's, but it still remains a common butterfly. Thankfully, a decline similar to that experienced by the Wall Brown has never materialised and a return to better numbers should continue over the next few years. Flight period: The first butterflies are generally on the wing from the middle of June, but earlier records occur in years when the Spring is notably warmer. There are a few records for the end of May, but records from earlier in May must be regarded as spurious. The main flight period is late June to early August, with a clear and pronounced peak coming in July when the number of records is over three times the totals for June and August. 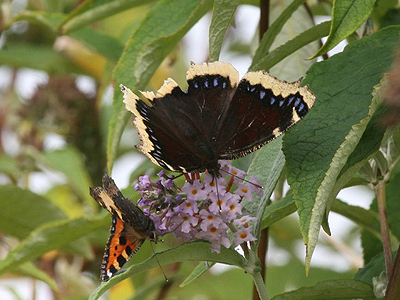 Late butterflies can be found into early September. Historical records: Recorded by Carr as being 'locally common, especially in the south of the county'. Carr goes on to mention it 'occurs in profusion in the lanes about Cotgrave, Cropwell, Owthorpe and Widmerpool etc. Also abundant about Thorney and Wigsley, common about Kingston-upon-Soar, West Leake and Gotham Hills'. 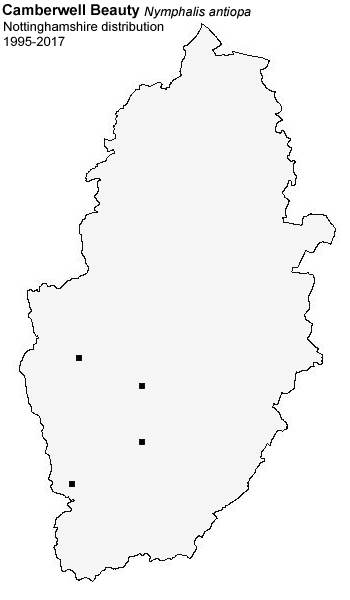 Referring to sites in the north of Nottinghamshire, Carr states that it is 'fairly common about Worksop and in Sherwood Forest (Lady Robinson), common at Rufford (Becher), but not common about Mansfield' (Daws). In a further statement, Carr lists it as 'common by 1886-1887 from South Leverton near Retford, after which it decreased in numbers and by 1897 had apparently disappeared entirely' (Thornley). Also recorded from East Bridgford and Langford Moor (Saunt). Current distribution and status: In common with the previous species, the Gatekeeper has passed through over two decades with wildly varying fortunes, including a three year low between 2006 and 2008, which most other Satyrinae also experienced. Whilst it is now a very common and widespread butterfly of mature hedgerows, along woodland rides and edges on a range of soils, it hasn't always been so. This is another butterfly which in the early 1980's, was hard to find in Nottinghamshire, but then underwent a considerable range expansion during the 1990's. It is now found across the county and has a distribution almost identical to that of the Meadow Brown. Wildly varying fortunes in the Gatekeeper's Nottinghamshire population is certainly nothing new, as Carr related how it was 'common' at South Leverton near Retford in the late 1880's, yet had 'apparently disappeared entirely' a decade later. We've described the Gatekeeper's population trend since 1995 as 'stable' despite the constant peaks and troughs produced during that time. Indeed, it seems that Gatekeeper numbers habitually fluctuate over three or four years; roughly taking three years for numbers to build to a peak following a drop in numbers. It seems that reductions can also take place over the course of three years, but there was a large drop in numbers in 2012 after a pronounced high the year before. Flight period: The first butterflies often occur in the first week of July, but occasionally from the last week of June. The main flight period is from mid-July through to mid-August, with a few late butterflies found into early September. There are a number of ridiculously early claims (including May) but these cannot be taken with any degree of seriousness, unless they refer to the larval stage. Carr later states that ' according to Brameld, it used to be common at Kirton near Tuxford, at Warsop and near Mansfield; and Gascoyne fount it 'in one field at Egmanton near Tuxford in profusion'. Leivers apparently had two specimens in his collection, taken near Bingham in 1890..
Current distribution and status: For many years, Kirkby-in-Ashfield's Portland Park held Nottinghamshire's only known Marbled White colony. But in recent years, this delightful butterfly has increased its local range and has also been successfully introduced at a number of other sites. It favours dry, grassy sites with a profusion of nectar-bearing flowers, including former colliery spoil heaps, along disused railway lines and embankments etc. Most of the county's successful introductions/colonies, are situated on the strip of Magnesium Limestone running up the western side of Nottinghamshire, near to its border with neighbouring Derbyshire. 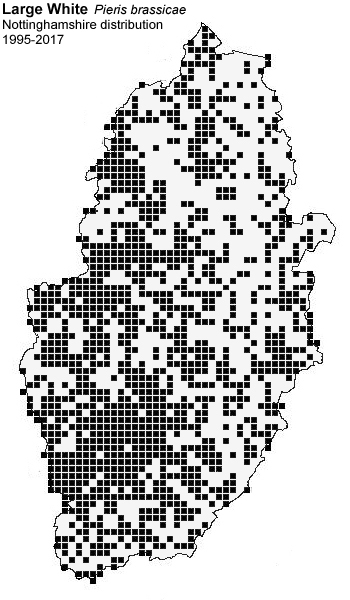 In the south of the county, the Marbled White tends to be more sporadic in occurrence, suggesting a more natural (and largely unsuccessful) range expansion into the county from the south. 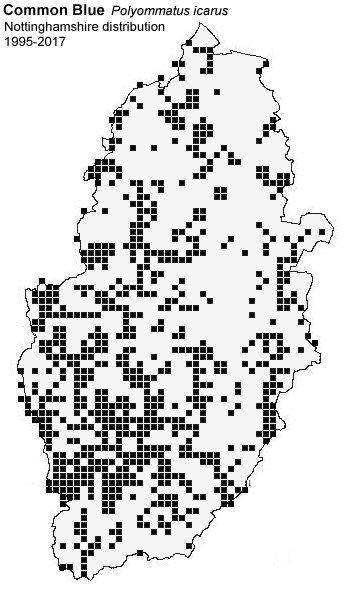 The Marbled White's range expansion into Nottinghamshire, coincides with a natural north-easterly expansion of its UK range. In Nottinghamshire, it has occurred (or is still present) at many sites including Netherfield Ash Lagoons, Warsop Main Pit Top, Hills and Holes at Market Warsop, Dyscarr Wood, Toton Sidings, Bingham Linear Park, Langar Wildflower Farm, Worksop Manor, Freckland wood (Newstead) Shirebrook Pit Wood, Shireoaks Pit Top and Attenborough NR, but there are many more sites where it is present, or has at least been recorded. 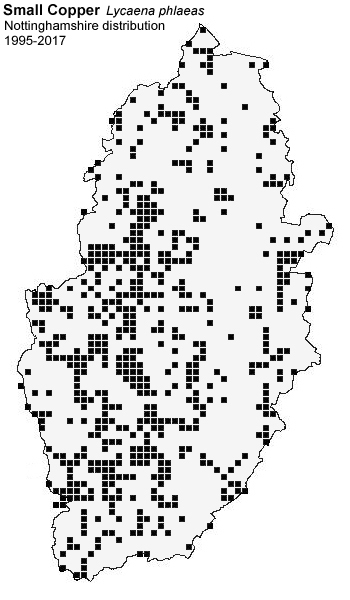 Aside from the known captive-bred releases (shown on the map as obvious clusters of 1km grid squares sited around former Collieries), the Marbled White's spread within the county has been helped by the network of disused railway lines that once linked many of these Collieries. 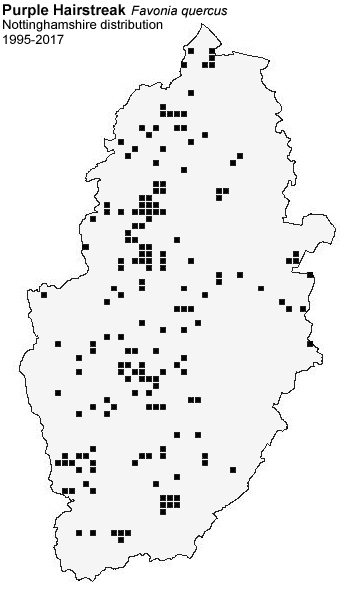 The Marbled White's restriction to just a single site at Kirkby-in-Ashfield, for many years meant that there was little change to its county status. Not really until 2014, was there any sign of increase in the butterfly's numbers, apart from a small increase after 2009. 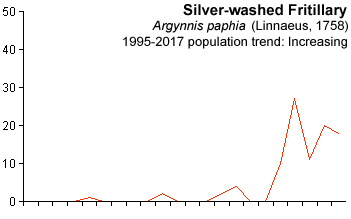 The increase has been dramatic and the number of reports now reaches around 50 per year, showing the greatest post-1995 increase of any of our native butterflies. The majority of generated reports are from regularly visited/recorded sites, including a thriving colony present at the Hills and Holes SSSI at Market Warsop since at least 2012. This colony is thankfully located on a small, ungrazed, annexed section of the site. In 2012, we counted a total of 50 adults during a visit in July, and the colony continues to draw a number of visitors annually - all very keen to see and photograph them. Flight period: Since 1995, there has been considerable variation in the Marbled White's reported first date, which may be the result of people waiting to hear of it actually being on the wing before visiting the Portland Park site. It's main flight period is from around the third week of June, peaking in July with numbers declining until late July or early August, but there are odd dates well into August. Historical records: Formerly common near Mansfield (Brameld) and used to be abundant in some seasons on sandy ground at Thieves Wood, where it was last seen in 1884 (Daws). In Sherwood Forest it was described as 'occasional' by Sterland, but J.W. Carr (and others of the time) had reasons to doubt many of Sterlands records. However, given the dry, sandy nature of Sherwood Forest, Grayling would have seemed likely to have occurred on areas of heathland such as Budby South Forest. 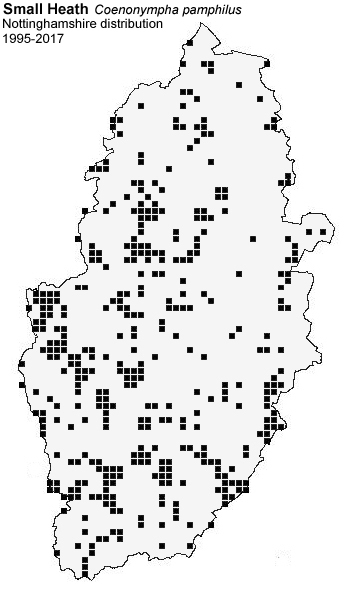 Current distribution and status: Now long extinct in Nottinghamshire. The last Nottinghamshire record appears to be from Rushcliffe Golf Course dated around 1963. The record is rather vague and there is little information other than a grid reference. Even the year isn't certain. Flight period: No details of any flight dates directly linked to Nottinghamshire. Flies from late July to September and with a peak in August, at most UK sites where it occurs. Historical records: There are a number of historical records listed by Carr, which suggests that the Pearl-bordered Fritillary was never a common and widespread butterfly in Nottinghamshire, rather it was restricted to woodlands lying on generally dry, sandy soils north of Newark, near Ravenshead and in the Clumber and Sherwood Forest areas. Carr's summary gives it as 'very common in Sherwood Forest (Brameld). Formerly common near Lime Tree Avenue in Clumber Park, but not seen there for some years (E. G. Alderson, 1901). He lists it as 'fairly common in Wellow Park (Becher) and common at Thorney in a small wood not far from Drinsey Nook in June 1891 (Henderson). Several in Markbush Wood, Thorney in 1900; Wigsley Wood, fairly plentiful in 1896; Langford Moor near Newark (Carr). Common at Newstead in 1883 (Wright) and taken commonly in Theives and Harlow Woods, though not so common of later years (since about 1890 (Daws) and at Owthorpe in 1912 (Saunt)'. There were two later records listed in Carr's Supplement, relating to two records from a 'wood near Cotgrave (presumably Cotgrave Forest) in June 1923 (Crosslet) and fairly common at Owthorpe in 1934' (E.A. Leivers). Current distribution and status: The Pearl-bordered Fritillary has been extinct in Nottinghamshire since the early 1980's, when it was recorded for the last time at Cotgrave Forest in 1981. There is another Cotgrave Forest record from 1978 (Radford, J.T. 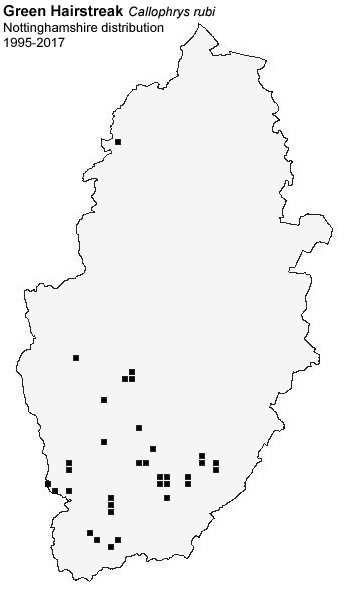 ), but as there appears to be no other county records listed anywhere between 1934 and 1978, it is impossible to say whether it was present at Cotgrave Forest during those intervening years, or they were the result of an attempted introduction of captive-bred stock. Flight period: Traditionally on the wing from late April till early June, with a peak in May. Historical records: Historical records from Clumber Park, Thorney, Theives Wood and Harlow Wood. In detail, Carr lists it as 'common at Clumber (Brameld). Clumber Park, Carburton etc, generally one or two seen each season (Lady Robinson). Several specimens taken in a small wood at Thorney in June 1893-4 (Henderson) and from Theives and Harlow Woods near Mansfield, not so frequent of later years (Daws)'. 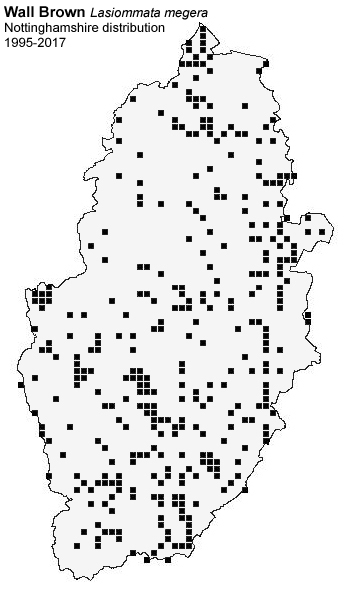 Current distribution and status: The Small Pearl-bordered Fritillary has long since been extinct in Nottinghamshire. There are no modern records and the ones listed by Carr remain the county's last known records. Flight period: Adults are on the wing from mid-May, through to the end of June. Historical records: Carr opens his summary of the butterfly, by describing it as being 'much rarer now than formerly'. He continues by stating that it 'used to swarm in Theives and Harlow Woods near Mansfield (Daws). Carr then goes on to list the following records. From 'Treswell Wood near Retford, several specimens in August 1901 and subsequently (Thornley). Single specimens have been seen at Rowhoe Wood, Widmerpool and on the adjoining Fosse Road and in the Owthorpe and Bunny Woods (Leivers). Woods about West Leake and Gotham and in Kingston Park, singly in 1905, 1906 and later (Thornley). Plumtree and Widmerpool in August 1912'. But Carr had trouble determining exactly who's records he believed and the status of the Silver-washed Fritillary in the Sherwood Forest area was particularly difficult to determine, until he largely dismissed one particular recorder's records. R.E. Brameld and W.J. Sterland were the most active recorders of Sherwood Forest's Lepidoptera at the time, and there was certainly some disagreement between the two. This resulted in some dubious 'single observer' records either claimed by Sterland himself, or published in his list of 'Lepidoptera taken in Sherwood Forest by the late John Trueman'. Carr was rightly reluctant to list any of Sterland's more fanciful claims in his book and in the end, sided on the more reliable records produced by Brameld. 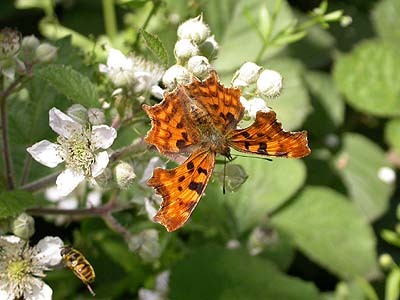 In several of Carr's species accounts, it is evident that Brameld and Sterland had opposing views on the status of some of the county's butterflies, as Carr goes on to state that 'the Silver-washed Fritillary used to be not at all uncommon in Sherwood Forest according to Sterland, but Brameld speaks of it as rare. It was 'taken there in recent years by J. R. Hardy, in the Birklands by A.R. Leivers and in Wellow Park by Rev. W. Becher'. There is an additional record in Carr's 1935 Supplement to his original book, 'from Widmerpool in 1917' (Sir T.S. Birkin, Bt.). Current distribution and status: The Silver-washed Fritillary was released into Gamston and Eaton Woods near Retford a number of years ago, and where it still survives in small numbers. The butterfly's presence there, resulted in many enthusiasts going to see it in Nottinghamshire for the first time, probably never actually expecting it to turn up anywhere else over the next few years. But recent years have seen an increasing number of records from across the county, which includes known releases of captive bred stock at both Dyscarr Wood and Cotgrave Forest in addition to Gamston and Eaton Woods, but probably also at several other sites. 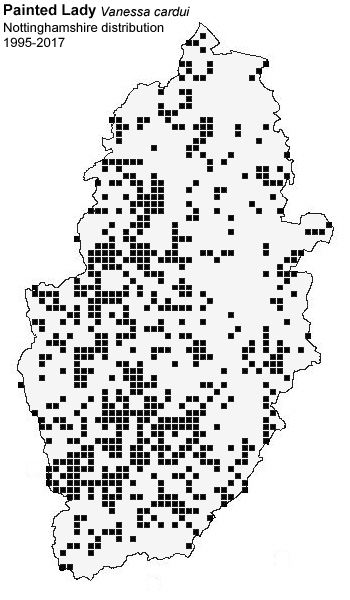 The number of isolated records from across the county, suggests that the butterfly is making some natural attempt to recolonise Nottinghamshire. In July 2014, we found a dead Silver-washed Fritillary at the side of the A60 near Mansfield Woodhouse. Completely distanced from any suitable breeding habitat (or possible release site) the location suggests likely migration and so do other recent records from Newstead and Annesley CP, Annesley Pit Top, Staunton Quarry, Bestwood Lodge, Idle Valley NR, Rainworth and from gardens in Calverton, Cotgrave, Woodthorpe and Radcliffe-on-Trent. In latter years, the Silver-washed Fritillary has done reasonably well in Nottinghamshire, but this is largely down to releases of captive stock. From the information available, it would appear that the Eaton, Gamston and Dyscarr Wood populations are struggling, but it is certainly doing better at Cotgrave Forest. Although the number of records make it harder to determine exactly how well it is doing, many Cotgrave Forest records will certainly relate to the same individual(s) reported by a number of different visitors. Any long term success as a breeding species in the county, may yet be dependant on the continued release of captive stock. Flight period: The first adults appear in the last week of June or early July, with peak numbers occurring in the second half of July and early August. Late Silver-washed Fritillaries can be found well into August, but the season is usually over by the middle of the month. There is an extremely late record from 15/09/16, which must be regarded as suspect in view of Nottinghamshire's other records. 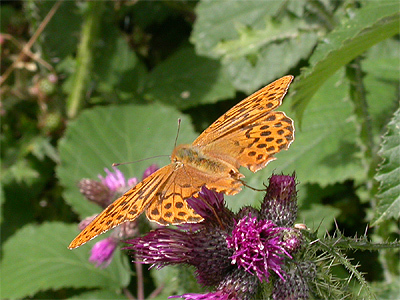 Historical records: Based on the number of records included in Carr's account of the species, the Dark-green Fritillary was historically much rarer than the Silver-washed Fritillary. Carr describes it as 'scarce', before the differing views of Brameld and Sterland surfaced again, with Carr writing 'frequent in Sherwood Forest (Sterland); formerly common there, now much less frequent (Brameld). Thieves and Harlow Woods; very few seen since 1890 (Daws). Two specimens at Thorney in 1894 (Henderson). A few specimens may be seen at Bunny Wood nearly every year (Leivers, 1901)'. 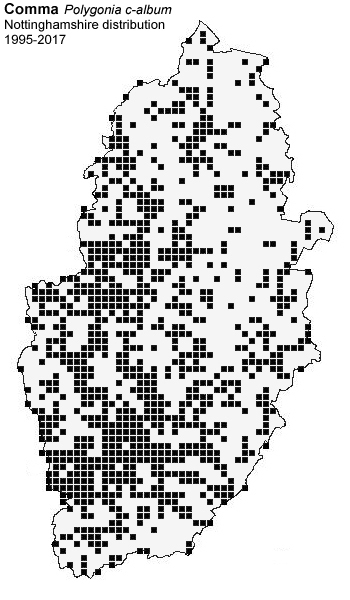 Carr quotes several additional records in his later Supplement and states it to be 'quite common every year for a number of years past in several fields near Cotgrave, Owthorpe and Widmerpool, especially in 1924-1926' (Carr, 1928). 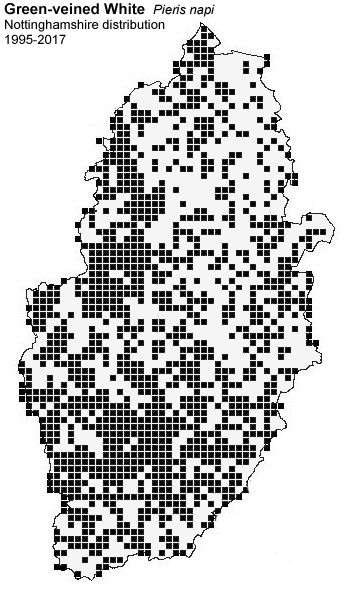 Current distribution and status: Sometime after the publication of Carr's 1935 Supplement to his original book, the Dark-green Fritillary died out as a breeding species in Nottinghamshire. Unfortunately, there is no literature to give us any idea of actually how long ago this was and in their publication 'A Checklist of the Lepidoptera of Nottinghamshire; 1993', Cooper & Wright list no post-1980 records. Since a record from Edwinstowe in 1999, there have been a number of sporadic occurrences. Although there is a case for a number of these records to be accepted as genuinely wild - the records from some sites are certainly the result of captive-bred releases. The most regular site where it was possible to see Dark-green Fritillary in recent years was Cotgrave Forest, where it occurred each year between 2011 and 2015. There have been no records since, which we are aware of and the population there now seems to have died out. One photographed at Dyscarr Wood in 2016, was also likely to have been released, but single records from Annesley Pit Top, Bevercotes Pit Wood, Bingham, Bulwell Hall Park, East Bridgford, Rushcliffe CP and Watchwood, are difficult to place one way or another. 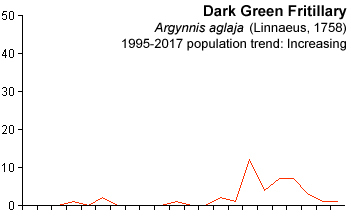 Certainly, the distribution map for Dark-green Fritillary is very similar to that of the Silver-washed Fritillary, but other than Cotgrave Forest and Dyscarr Wood, no two records are from the same site. Flight period: There is a pronounced July peak to Nottinghamshire's records. The first butterflies are typically recorded from early July, continuing until around the second week of August, but emergence was from the middle of June at Cotgrave Forest in 2011. Historical records: It is hard to imagine any of the Argynnis Fritillaries to have ever been common butterflies in Nottinghamshire, but it seems that even when Carr was writing his account, this species was on the decline over a hundred years ago. 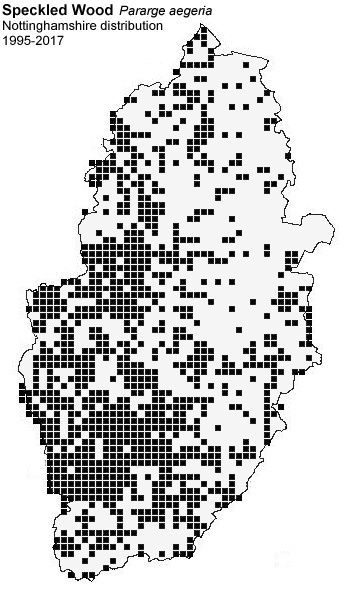 Carr generalises by stating it is 'still fairly frequent in some parts of Sherwood Forest and formerly not uncommon in many places where it is now scarce'. He continues with 'about a dozen specimens were taken in Sherwood Forest by R. and W. Tyrer and it was plentful in Clumber Park (Brameld)'. Lady Robinson also found it to be 'common in Clumber Park and also took it at Carburton and in Welbeck Park'. Clumber is mentioned again, with it being 'very common some years at Clumber Park (Rev. E. G. Alderson), occasionally near Ollerton (Becher) and in the Birklands (Leivers) and I (J. W. Carr) have taken it from Ragwort flowers in Budby Carr'. High Brown Fritillary was another species who's decline was noted from Theives and Harlow Woods, with Daws recalling that it had not been so common since 1890. Carr ends his summary with a record from Gotham Hills in August 1906 (F. Wakerley). The last Nottinghamshire record is believed to be from Widmerpool in 1920 (E.L. Crossley). Current distribution and status: Has declined considerably nationally. Now long since extinct as a Nottinghamshire butterfly, there appear to be no county records other than those listed above. Flight period: Flies from early July and into August. Historical records: There are believed to be no historically documented records of this species, as ever having occurred in Nottinghamshire prior to 1994 and it was not listed as having been recorded in the county by Carr. 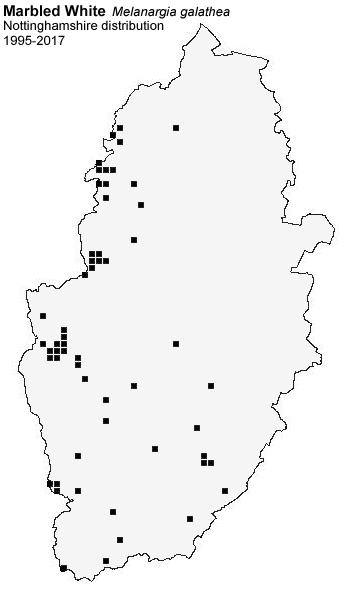 Current distribution and status: There have been a number of White Admiral records in Nottinghamshire since one at Colwick CP on 14/07/94 (Dennis, M.C. ), but determining whether these are of captive origin, or genuinely wild, is always going to be difficult. An unofficial release and introduction of captive bred stock into Eaton and Gamston Woods near Retford, took place sometime during the early 1990's and proved to be very popular with a number of visitors who travelled to see them. But the number of records sent to the county recorder, dropped rather sharply after peaking in 1998. There were apparently no records from either Eaton or Gamston Woods in 2003 and 2004, so another small peak in records between 2005 and 2008, might refer to a second release of captive stock there? There are believed to have been no further records at either woodland since 2008. The White Admiral is not known for straying any distance from it's favoured sites and habitat, but it has increased its UK range northwards, after becoming confined to southern counties during the early 1900's. Even allowing for occasional wanderers, there are some claimed Nottinghamshire records that certainly do not meet the criteria for them to be considered likely, or acceptable as genuinely wild insects. The NBN Atlas lists four White Admiral records for Nottinghamshire (two are probably duplicates) from SK65 and SK77 which are best ignored, both having 'start' and 'end' dates for the records some 28 years apart, between 01/01/1980 and 01/01/2008. Neither of these records are showed on the distribution map above. The problem of released stock potentially turning up anywhere, also tends to cloud any objective viewpoint as to the credentials of the following records. Although we have no reason to doubt the validity of any White Admiral identification, the following records should be treated with caution, before being classed as of wild origin: Winthorpe on 27/07/04, at Bramcote on 14/07/06, Portland Park on 29/07/10, Blidworth on 27/08/10, Netherfield Lagoons on 28/07/12 and Duke's Wood on 17/07/15. Flight period: All but just two of the county's White Admiral records are from July, with the first butterflies usually appearing from the second week of July and flying in a single brood until the end of the month, occasionally just into August. Of the county's two August records, one reported from Blidworth on 27/08/10 is extremely late. 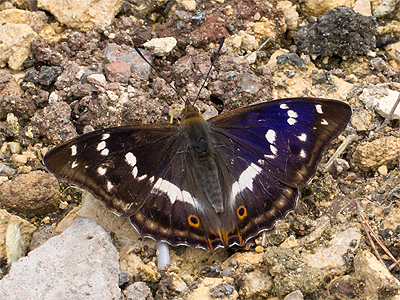 Historical records: Although it was always possible that there was an element of under-recording due to this butterfly's arboreal habits, the Purple Emperor was never a common or widespread butterfly in Nottinghamshire and had seemingly declined to the point of extinction well over a century ago. Carr's species summary opens with him stating that 'the Purple Emperor is now very rare and has not been taken recently'. He then continues by stating that 'this may be due to a decrease in the number of local entomologists, rather than a decrease of the butterfly'. Most of the listed historial records in Carr's book are from woodlands in the north of Nottinghamshire, with Wellow Wood being particularly favoured. Carr states that it 'has been seen and taken many times in parts of the district' [Sherwood Forest]. He goes on to mention that he 'had one in his collection which was taken on Risebrigg Lane near Rufford; and that a few years ago 16 or 17 were seen within the course of a week at Wellow Wood, but only three or four were taken'. In 1859, a 'female was taken inside a pigstye near the edge of Wellow Wood and another was near Mansfield the same year (Brameld)'. Based on the number of records, the Purple Emperor's Nottinghamshire stronghold was the Sherwood Forest area, but probably not always referring to the area which is now Sherwood Forest Country Park. Bear in mind that the Forest was once considerably larger than it is today and that a given site of Sherwood Forest, may well have been generalised by entomologists in their accounts and by J.W. Carr in his later writing. Sterland mentions 'that J. Trueman took several in the Forest', but there are no records which we can actually determine were from within the confines of the Country Park. Two males and a female were taken at Cossus (Goat Moth) borings in old Oaks in the Forest close to Edwinstowe in 1874 and a female was captured and two others seen in the same place in 1875 (Hardy), but the location is unfortunately rather vague and not of a great deal of use. The few other records that Carr lists in his original book, refer to 'the Winkburn Woods (Becher) and a few specimens have been seen over the tops of the Oaks in Theives Wood near Mansfield, one as lately as 1895 (Daws) and it was 'occasional near Newark' (which may refer to Langford Moor) where it was 'taken repeatedly' (Tomlinson) and belatedly adds a record of a 'female taken in the 1880's from Cocking Hill, Boughton near Ollerton' (G.B. Berkinshaw). Current distribution and status: Presently known from just Cotgrave Forest in the south of the county. The origins of the present population of this magnificent Butterfly in Nottinghamshire are from released stock. The population at Cotgrave Forest has been reported since 2016, but were believed to have been present for a year or two before. At Wellow Park near New Ollerton, a number of larvae were known to have been released in early 2016 and possibly before this. Whatever origins Cotgrave Forest's butterflies have, they make a welcome re-addition to the county's fauna and certainly attracted good numbers of visitors to see them in 2017. The number of records in the table above may probably be slightly high, allowing for a number of observers recording the same individual, but at least five different Purple Emperors were noted by one observer in July 2016. In 2017, a rare example of the aberrent form Apatura iris ab.lugenda was seen by several visitors including Michael Walker, who very kindly allowed us to use his photographs illustrating the butterfly. Genuinely wild Nottinghamshire Purple Emperors were last known from Wellow Park many years ago, but we had word from one observer who says that 'they occurred in a part of the wood till a good number of years ago' but who can remember seeing them. There has been an attempt to reinstate them at Wellow Park again in the last few years, and two were indeed seen there on 14/07/16 (Broomhead, J.) although we know of no other records. 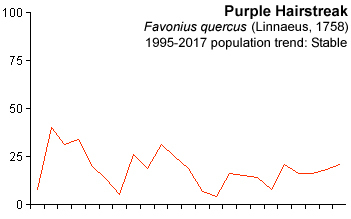 Flight period: In favourable years, Purple Emperors emerge in June, but early July is usually more typical at most UK sites. A peak occurs in the second or third week of July, before numbers quickly seem to decline. We have little information with regard to Nottinghamshire Purple Emperors, but the Cotgrave Forest butterflies have been recorded between inclusive dates of July 15th to July 25th 2015, July 13th to August 12th 2016 and June 25th to July 17th 2017. Historical records: Obviously a common migrant to Nottinghamshire, as Carr broadly described it as being 'generally distributed and moderately common most years, but in some seasons quite abundant'. The only individual records he listed were of 'one seen on the wing on June 10th 1899 and on several subsequent days, at South Leverton (Thornley) and 'in 1900 atalanta was flying at Mansfield in December' (Daws). Quite why Carr listed the South Leverton record is a bit of a mystery, as this would not have been unusual even back then. Current distribution and status: Carr's opening statement remains rather appropriate over a century later, as the Red Admiral is still our most regularly ocurring migrant and recorded in varying numbers annually. But there has been one change to the Red Admiral's Nottinghamshire status over recent decades, as it is now recorded over-wintering here with greater frequency and can often the first butterfly many recorders see in early Spring. Although still very much a common migrant to Nottinghamshire, there was a general decline in the number of records after the turn of the new century. 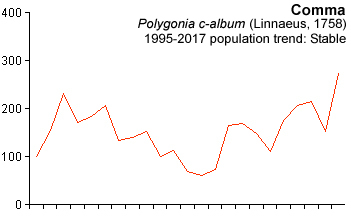 Following good years in 1996, 1998 and a small peak in numbers in 2003, the Red Admiral showed a slump in reported numbers after 2000. 2008 represented the poorest year for the butterfly in recent years, but there has been signs of a gradual increase since 2005. Typical of all migrant species, there has been a great deal of annual variation and there were pronounced influxes into the county during 2011 and 2014. The Red Admiral is not fussy regarding habitat, and as would be expected from such a common migrant, records have come from all habitat types and all areas of the county. It commonly occurs in most gardens during the late Summer and Autumn months, being well known for its love of fallen fruit and many butterflies will stop off for a number of days in urban gardens during September and October. Migration: Occurs regularly as a migrant butterfly, actively moving through many open sites in Nottinghamshire. There is a definite southerly return movement in the Autumn, but this was still largely dismissed as fanciful speculation, with the 'authorities' claiming there was little evidence to confirm it as an actual event. It is however an annual phenomenon and one we have personally been aware of for many years, although the nature of any southerly movement is dependent on the number of migrants arriving here in the Spring. Spring Red Admiral migration is less distinct and certainly nothing on the scale of the two enormous Painted Lady invasions we experienced of recent decades. 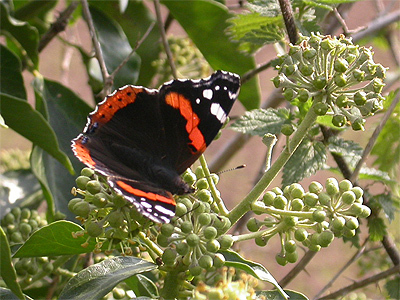 2002 was notable for its migration, producing 135 Red Admirals moving through the Eakring area between August 20th and September 30th. This peaked at 82 recorded moving south on September 30th, over a period of three hours. Movement occurred in the early afternoon, following what had been an overcast and misty morning. Much of the total consisted of loose groups of up to seven butterflies at a time with regular frequency. All were found to be flying at a steady height of a few feet, which was noticed to be maintained, despite differences in ground contour and altitude at various points along the hill. Most butterflies flew into the wind, but migration was most often recorded when winds were light. Another good movement took place a few years later on August 3rd 2003, coinciding with an exceptional movement of seven other species. A total of 1,281 butterflies of eight species moved low south-west in five hours. Among the total were 134 Red Admiral, 716 Painted Lady and 179 Large White, but surprisingly 106 Peacock and 47 Small Tortoiseshell. Flight period: With a total of seven December, eight January and 18 February records up to 2017, the Red Admiral now occurs throughout the year in Nottinghamshire, probably as a direct result of climatic changes since the 1970's and 1980's. Most records occur after the first arrivals from the continent in April and May. It is often common any time after June, with peak numbers occurring from July until September. Butterflies generally remain common well into October most years and November records are no longer unusual. Historical records: Carr's opening statement to his Painted Lady summary of 'usually very scarce and in some seasons not seen at all, but in others just as common - particularly in 'edusa years'. Colias edusa was a previous name for Colias croceus (the Clouded Yellow) and the two species do often arrive in the UK simultaneously, although the Painted Lady generally always occurs in larger numbers. Carr lists no individual records, but relates rather generalised accounts from entomologists of the time. He goes on to write that 'from 1875 to 1880 it was very plentiful around Southwell (Henderson), extremely abundant at Nottingham in August 1883 (Wright), plentiful in some seasons about Mansfield, e.g. 1887 and 1898 (Daws) and occasional about Worksop, Carlton-in-Lindrick, Clumber etc (Lady Robinson)'. He continues his summary by mentioning that it was 'fairly common near Edwinstowe in 1892 and that it was 'again common throughout the county in 1900, especially along the Fosse Road between Cotgrave and Widmerpool an again in 1903. Since then it has been seen about West Leake and Kingston-upon-Soar by Rev. A. Thornley and myself, and at Owthorpe in 1907 and Clipston in 1908. Abundant on the Fosse Road between Cotgrave and Widmerpool in 1914 and also seen at Linby. Current distribution and status: Occurs purely as a migrant butterfly to Nottinghamshire, where it appears in varying numbers annually. Most years, it is less frequent than the Red Admiral and there are considerably fewer individual records from the county as a result. It is a butterfly which will be found in any habitat throughout the county. 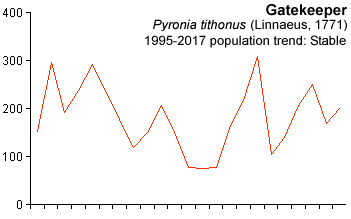 Apart from four, obviously good years in 1996, 2003 2009 and 2015 (every six or seven years), there has been little change to the numbers of Painted Ladies reaching Nottinghamshire and although we describe it as being annually variable, the larger European population seems to be relatively stable. Migration: Recorded in varying numbers with occasional Spring influxes of enormous proportions and involving millions of individual Painted Ladies. There have been two such invasions in the past few years, with many remembering the first of these back in 1996. It was of a larger scale than a similar event in 2009 and was an astounding experience for those lucky enough to witness it. Although we have no actual totals from the time (despite some counts being made) the largest movement occurred on June 8th 1996, when thousands of Painted Ladies were recorded moving north across open fields. At Gringley Carr, hundreds were present along the road running down to the River Idle late evening, and at least one would be flushed at almost every step. It was an event almost repeated 13 years later. Early Spring 2009 saw massive numbers of Painted Ladies move through northern Africa and Europe, before eventually arriving in southern areas of the UK in the third week of May. It was widely estimated that between 10 and 50 million Painted Ladies were involved in this particular migration and the whole of Nottinghamshire featured in the event, although the migratory context of it went largely unnoticed. By the time word got round, most had missed out on what was a truly remarkable period of migration and one which is deserved of being documented again here. The event had been predicted earlier in the year, after enormous counts of Painted Lady pupae were noted in fields around the Atlas Mountains in Morocco. Alerts of the potential for a large scale Painted Lady migration, were made on an Internet Discussion Group at the time and in early April, large numbers of Painted Ladies started to move through southern Spain. Painted Ladies (mostly ones and twos) began to be seen in the UK during late April and early May. More substantial movement was noted through Cornwall during the second week of May and along the southern UK coast on May 21st. Corresponding with this, Painted Ladies were noted in Nottinghamshire at Eakring Flash and in a garden at Beeston Rylands on May 22nd. Unfortunately there was little coverage on May 24th/25th, the day on which millions of Painted Ladies arrived. We noted them passing through wooded glades in Sherwood Forest, but had no idea of the scale of the event at the time. Movement over the next few days was limited through a period of unsettled and windy weather, but began again when warm, sunny weather returned. We were once more in Sherwood Forest when a constant stream of Painted Ladies were noted moving north on May 28th, following every contour of the trees and ground. Purposely moving to the open farmland of Red Hill at Eakring, we began to systematically count Painted Ladies as they moved over a 100m section of arable farmland. Counts were made during the afternoons of three consecutive days and brief written accounts were published on this website at the time. Movement in the south of the UK was also still strong on May 28th, but decreased dramatically the day after and there were no large counts reported from southern areas after May 28th. It was interesting to see that the main wave of Painted Ladies was obviously continuing to move north through the country and observers in Yorkshire and Lancashire were to see their highest numbers on May 29th and 30th. A total of 1,414 Painted Ladies moved north through Eakring on the afternoon of May 28th and there were three five minute periods when three figure counts occurred, with a maximum of 140 Painted Ladies moving through between 15:50h and 15:55h. There was some evidence that movement was higher when it was sunny. Given the Cumulus nature of the cloud on this afternoon, periods of cloudiness were brief, but movement significantly lowered and several Painted Ladies were noted being tempted to halt their movement by dropping into the crops to rest. Painted Lady butterflies continued to move through Eakring on the afternoon of May 29th, although in much reduced numbers than the previous afternoon. Movements on this day were generally straight WNW, but there appeared to be a definite south-easterly movement into the wind, something that was not noted on May 28th. A total of 728 Painted Ladies were recorded. We again made counts of five minute periods from 14:25h-15:50h. There was also a distinct decline in movement throughout the watch. Numbers peaked between 60-70 per five minute periods, between 14:35h and 15:05h, dropping to between 38-45 from 14:55h and 15:30h. The last four five minute counts produced counts between 12 and 21, so there was a clear drop in movement. Painted Ladies were still moving through on May 30th. A one hour sample count, again divided into five minute periods, produced a maximum of 24 through between 16:05h and 16:10h. The majority of butterflies were heading more or less into the wind today and going north-east, but there were smaller numbers that continued to fly west. 191 through in an hour, would still represent an amazing Spring count for the whole of any Spring away from 2009. Autumn migration is easily missed, as it is usually earlier than that of the Red Admiral, and never of the scale seen occasionally in Spring. The largest movement we recorded between 1995 and 2017 was of 93 moving south in two hours on August 9th 2009, and was earlier than had been expected following the huge invasion of that Spring. Flight period: The first Painted Ladies arrive towards the end of May, often in the third week and these adults go in to produce a succession of broods. 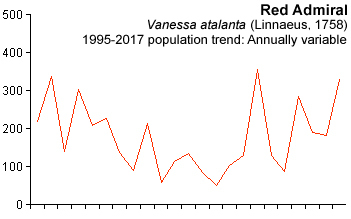 Numbers generally remain high from June to September, but with a definite peak in the number of records during August, but variations in the dates are dependent on good Painted Lady years and arrival dates. There are fewer records for October and single reports for November 1st 2003 and an extraordinarily late date of December 15th 1996. Historical records: Carr gives the Peacock a rather conflicting species summary, in which he states that it was 'not common and uncertain in its appearance', but then opposingly states 'records numerous and from all parts of the county'. His rather short summary ends with 'in August and September 1900 it was quite common, especially on the Fosse Road between Cotgrave and Widmerpool'. By the time Carr got round to publishing his supplementary follow-up to his original book, there are signs that this butterfly was starting to increase. He recalls that 'during the last ten years or so, a few have been seen annually on Buddleia in my garden in Mapperley Park'. In 1934, A.R. Leivers added 'I have never found larvae in the county. Leivers also added that it 'appeared in my garden at Sherwood, Nottingham in the late Summer of 1933, for the first time in many years'. Carr's later summary mentions that it was 'also seen at Mapperley, Wollaton and elsewhere in and about Nottingham'. Current distribution and status: The Peacock continues to be one of our most regularly recorded butterflies. Found in all habitat types and over the whole of Nottinghamshire, it has a generally stable population, though prone to occasional years (or periods) of abundance, when it can be the commonest species at garden Buddleias. Opposingly, it can have years when it is sometimes slightly harder to find. It often suffers considerably from parasitism whilst in the larval stage, but greater damage is probably done to local Peacock populations through cutting roadside grass verges too regularly and our continued obsession with 'tidying' up our country parks and urban green spaces. 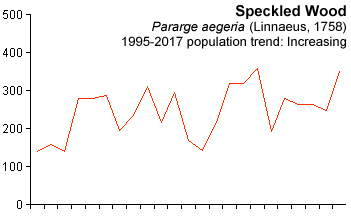 In the late 1990's, the Peacock was extremely common for three consecutive years from 1996 to 1999, before a fall in numbers saw the population remain steady until another increase took place from 2009 to 2011. A short-lived fall in numbers occurred in 2012, before rising over the next two years, although since 2016, numbers appear to be on the decline again, although this looks set to be temporary. A count of 692 Peacocks on Buddleias at Langwith Quarry on July 26th 2014, was our most notable count. Flight period: Overwinters as an adult in the darker corners of sheds, outbuildings, log piles and hollow trees and tends to begin over-wintering earlier than most other butterflies. Peacocks often appear on the first warm days of the year and there are a number of records for January and February, when some butterflies are tempted out early. The appear more regularly during the second half of March and numbers reach a peak in April, falling during May. This is a long lived species and some individuals can still be on the wing during June, depending on how early the season is. The resulting second brood of Peacock appear during July and remain common throughout the first half of August. By September, they are much less frequently reported and are certainly unusual after early October. There are a number of records for November and December. Historical records: This was obviously a common butterfly at the turn of the last century, with Carr simply stating that 'the Small Tortoiseshell is very common and universally distributed in Nottinghamshire'. Current distribution and status: The Small Tortoiseshell still remains very much a common Nottinghamshire butterfly today, despite all the negative publicity issued by the relevant authorities a few years ago. It is found in all habitat types and is a regular visitor to garden flowers, with Buddleia being a particularly strong attractant. Despite being one of our more attractive butterflies, it is rarely given a second glance through its familiarity, in much the same way as the preceding species. The publicity regarding the Small Tortoiseshell's apparent decline over much of the UK, rather incorrectly (to our minds at least) focussed on the arrival of the Tachinid fly Sturmia bella (Meigen, 1824) in the UK. Sturmia bella is a parasitic species first recorded Hampshire in 1998, but it has not been recorded from Nottinghamshire; or at least there are no published records for the county. We consider it very likely to be present as there are records across southern counties of the UK, extending north past Nottinghamshire (per NBN Atlas). But a decline, either across the UK or restricted to Nottinghamshire, cannot be blamed on just one species. There are other parasitic species which could be equally responsible, but the cause is just as likely to be climatic, or of our own making. 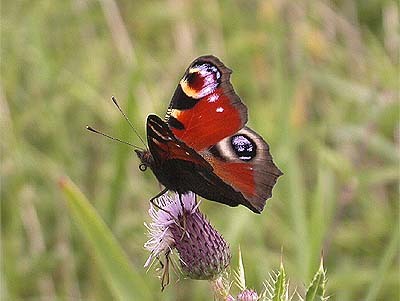 For much the same reasons as we gave for the Peacock, our continued and seemingly determined efforts to tidy the countryside, urban parks and open spaces and reduce the soil area of our gardens, is as likely a cause as parasitism for any decline. 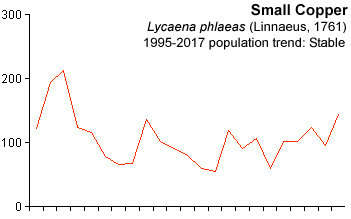 In Nottinghamshire, there has been a decline but this may have been over-emphasised by the Small Tortoiseshell having a number of very good years in the latter part of the 1990's. 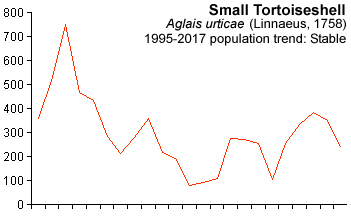 The decline started after a bumper year in 1997 and Small Tortoiseshell numbers ultimately reached a low between 2006 and 2008. But we found an identical low point in the populations of most other species occurring in Nottinghamshire, and feel the dominant cause was more likely to have been climatic, rather than parasitic. Since 2008 however, there has been something of a recovery. This proved to be extremely similar to the recovery showed by the Peacock after 2009, with comparitively poor years in 2012 affecting both species. Flight period: Overwinters as an adult, usually in outbuildings, garages and sheds etc. The first butterflies are often reported as early as January, when they may be tempted out of their dormancy by mild weather. The number of January and February records has proved to be very similar (under 30 records), but it is after the middle of March when sightings increase. There are two, sometimes three broods a year, and after a peak during April, May and June are generally slightly quieter, though each producing many records. 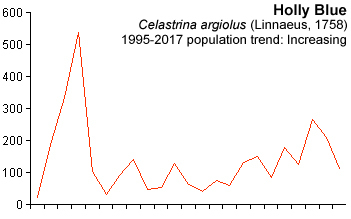 There is a clear second peak in records during July and butterflies remain common until September, with fewer records in October. Late butterflies will often be encountered in November, but December records are rare, with just four recorded in Nottinghamshire since 1995. Historical records: Based on the records and accounts of this butterfly in Carr's book, the Camberwell Beauty was a rare migrant to Nottinghamshire even then and barely more frequent in the county than it is now. Carr lists records from 1846, 1858, 1860, 1864, 1872 and 1890 and opens his summary by stating that 'records of this fine species in Nottinghamshire are fairly numerous'. Individually listing records, Carr gives 'one at Worksop and one at Southwell in 1846 and one taken some years before near Nottingham (J. Wolley). One in Sherwood Forest in September 1858 (Wilson) and one seen in Sherwood Forest in August 1872 and others heard of from residents at Edwinstowe (H. Birchall). The year 1860 seems to have been particularly notable, with Carr stating that there were 'four captured in the Forest [Sherwood] and two at Welbeck by J. Trueman and two others near Edwinstowe (Sterland). This is followed by a quote relating 'in 1860 this species was common about Mansfield. I have taken two here. A nice series was taken by the late Lady Walker at Berry Hill. They were again fairly numerous in 1864' (Daws). Carr ends his summary with 'Brameld reports several specimens taken in Nottinghamshire in 1872'; and relates that 'the Nottingham papers, in or about 1890, reportedthat a Camberwell Beauty had been seen flying in a road in the city'. Current distribution and status: A rare migrant to the UK, but not annual and largely occurring in years when obvous influxes take place. In Nottinghamshire, the Camberwell Beauty is especially rare and there are few recent records. Of those we can trace, there were at least three individuals recorded in the latter part of the 1990's, coming from Calverton and Chilwell in Spring 1996, with another at Chilwell in August of the same year. There was one recorded at Carlton (Cox, K.) in Spring 1997, but the most recent (and twitchable) Camberwell Beauty, was one found at Annesley Pit Top (Naylor, P. et al) in September 2011. Our thanks go to Nigel Davis, who has kindly allowed us to use his photograph below of the Annesley Pit Top Camberwell Beauty. Flight period: Occurring in Nottinghamshire either as a captive-bred release, or as a genuine migrant. Butterflies are believed to originate from Scandinavia or the near Continent and usually arrive during August and September. One recorded from Carlton in Spring 1997, indicates that it has successfully overwintered here. Historical records: This species had obviously been declining for many years, as Carr mentions old records from Nottingham, Newark, Ollerton and [Market] Warsop and that according to Sterland, it was 'frequent in Sherwood Forest'. He goes on to state that 'in more recent times, it has been taken in Sherwood Forest by J.R. Hardy and at Mansfield several times between 1876 and 1884 (Daws)'. 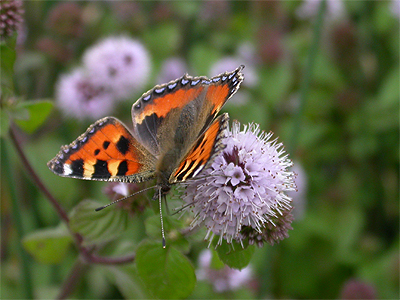 Carr also goes on to list 'one on a thistle-head near Widmerpool in August 1893', but the last Nottinghamshire Large Tortoiseshell records seem to have been from Worksop, with Carr stating that 'several fine specimens were seen and one taken in Park Place, Worksop and one in 1894 in the orchard at Park House, Worksop (Lady Robinson)'. 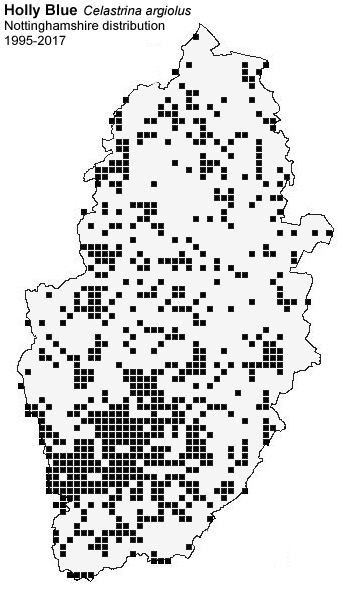 Current distribution and status: The Large Tortioseshell is long extinct in Nottinghamshire and now only occurs as a very rare/occasional migrant to south-eastern coasts, or (potentially) as captive-bred releases or escapes. There are however, two recent 'claims' of this butterfly from Nottinghamshire. The first was reported from Attenborough NR on September 20th 2003 and the second more recently, from Potwell Dyke Grasslands at Southwell on July 29th 2017. Both records appear to be unsubstantiated with supporting photographs or descriptions etc. Although the date of the Attenborough record would support the case for a genuine migrant Large Tortioseshell, the record is unacceptable as the lack of any photograph cannot rule out the possibility of Scarce Tortioseshell Nymphalis xanthomelas ([Denis & Schiffermüller], 1775) formerly known as the Yellow-legged Tortoiseshell - a species that turned up in south-east counties of the UK in 2014, following an influx into the Netherlands. The Southwell record is earlier in the year than the Attenborough NR one, although within the butterfly's expected flight period and not too early to be a genuine migrant. If the original identification was indeed correct, the sighting was sent via iRecord and not reported directly to the county recorder at the time. This record has to be regarded as being unacceptable, without some supporting evidence. Flight period: Adults over-winter, breeding in the Spring and the resulting butterflies are on the wing from the middle of July onwards. Migrants (latterly proved to be the Scarce Tortioseshell) arrive from mid-July onwards and have been recorded in the Spring, after successfully overwintering. 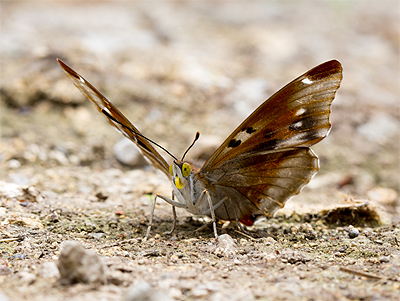 Historical records: This butterfly is the classic example of how a species can make a pronounced range expansion, a number of years after suffering an enormous decline. By the mid-1800's, the Comma had declined nationally and it became largely confined to counties on the Welsh border. When Carr produced his book in 1916, he writes at the start of his summary that it 'appears to have been not very common formerly, but is now very rare'. Carr's doubt about most things Sterland reported is palpable, when he goes on to say that 'according to Sterland, it was 'plentiful' in Sherwood Forest and it was 'not very uncommon at Southwell' within the recollection of Rev. W. Becher'. 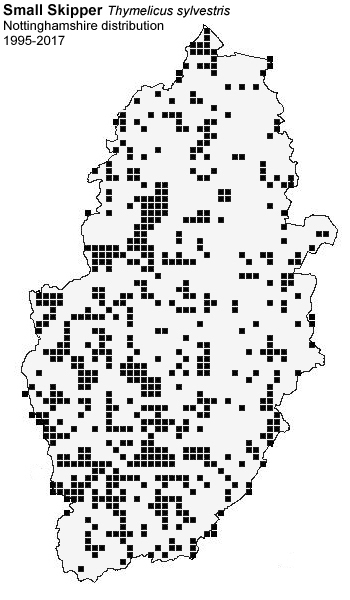 Carr also lists published records of its occurrence at 'Mansfield in 1857 (W. H. Smith) and 1859 (Brameld) and up to recent years, odd specimens have occasionally turned up at the same place and at Theives Wood' (Daws), with Carr possibly indicating that small populations may have held on at some sites for a number of years before dying out. He goes on to mention that 'other recorded localities are Warsop and Ollerton (Brameld) and Newark (Gascoyne). Carr ends his summary with 'the most recent capture of which I have a note, is of a worn specimen taken in Park House gardens, at Worksop in 1893 by Miss E.M. Alderson (now Lady Robinson)', but in the later supplement to his original book, he mentions that 'a specimen was captured by the late Mr D.H. Pearson in his garden at Chilwell in September 1920. Current distribution and status: Now once again a common butterfly across most of Nottinghamshire, following a huge resurgence since the 1960's. The Comma is generally found in more wooded habitats and along stretches of mature hedgerows etc. But it is by no means restricted to these, as it is also very much at home in our suburban parks and gardens, despite the greatest number of records coming from the more forested areas lying on Sherwood Sandstone. The Comma has always been much less frequently reported than both the Small Tortoiseshell and Peacock, but all three butterflies have fared similarly since 1995. Despite suffering a decline in numbers after doing well in the late 1990's, the Comma appears to be on the increase once again. In fact, the number of records in 2017, ultimately proved to be the highest since 1997. This is another butterfly which suffered a run of poor years between 2006 and 2008. But it's recovery has seen numbers increase to more than four times what they were in 2007, despite not doing as well in 2012 and 2016. Flight period: Overwinters as an adult, usually in more natural sites such as hollow trees, log piles, or deep within Ivy growing on trees and walls etc. The earliest Nottinghamshire records have come in February (just three, with one in January) but for most, the first reappear in late March. There are two broods in the year, the first producing a Spring peak made up entirely of post-hibernating adults in April. A proportion of the butterflies of this brood, are of the lighter form Polygonia c-album f. hutchinsoni, and it is these which breed to produce a further brood of butterflies later in the Summer. The second peak in Comma numbers occurs in July, with subsequent numbers declining as August and September progress. By October, most have entered hibernation, but there are a number of records well into November. Interestingly, there have been no December records in the years since 1995. Nine species recorded in Nottinghamshire, with wildly differing fortunes for three of these. Silver-studded Blue became extinct as a breeding butterfly in the late 1800's, the Holly Blue established itself in the county sometime during the 1900's and the Brown Argus reappeared in 1997, after a gap of 40 years. Both Small Copper and Common Blue remain the most regularly recorded of Nottinghamshire's nine Lycaenidae and are still widespread and common butterflies. 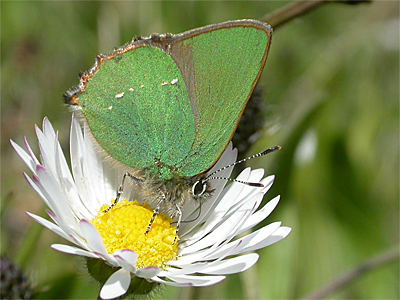 The Green Hairstreak has substantially increased its range across southern parts of the county since 1995, and both Purple Hairstreak and White-letter Hairstreak are widespread, although their arboreal habits make them under-recorded in the county. 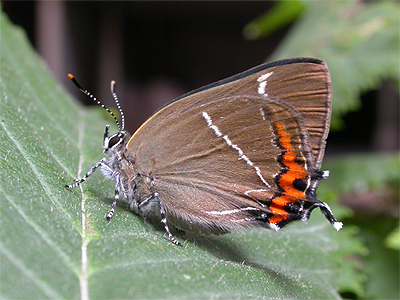 Nottinghamshire few Brown Hairstreak records, are all of captive-bred origin. Historical records: Summarised by Carr as being 'common and universlly distributed, but more abundant in the dry, Triassic Sandstone area of central and northern parts of the county, than on the moist clay lands of the south'. 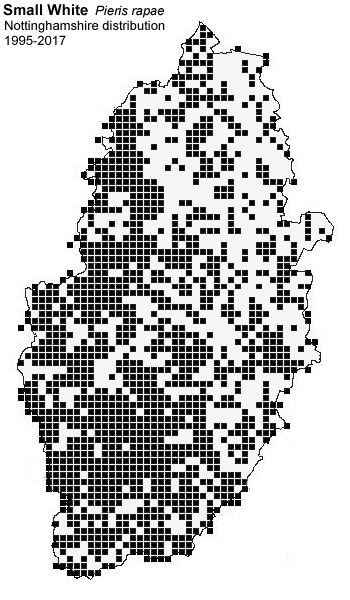 Current distribution and status: Carr's century old statement regarding the Small Copper's distribution within the county, pretty much holds true with the butterfly's distribution today. However, the distribution map suggests that this charming butterfly is by far from being 'universally distributed' to quote Carr. The lack of recent reports suggest that it is largely absent (possibly present in low density populations) from many sites lying on Mercia Mudstone. This includes sections of the Trent Valley and areas east and north of Retford. 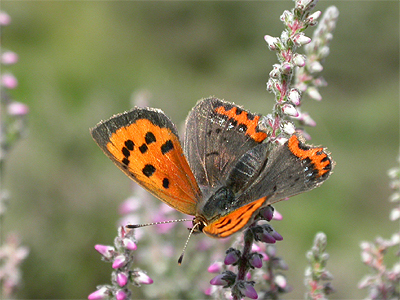 The Small Copper is a butterfly with very few habitat demands. It is certainly never found at any site in numbers; usually recorded singly, males persuing females, or males battling other males over territory. Often found on post-industrial brownfield sites, it is an early pioneering species of most of Nottinghamshire's former Collieries and disused railway lines etc. It does have a preference for areas where the vegetation is sparse, so is not often encountered deep within woodland, rather preferring the sides of rough forest tracks. Odd examples will occasionally turn up in gardens and in the untidy corners of urban parks and playing fields. Nottinghamshire's Small Copper population has showed quite remarkable stability over the past 20 or so years. 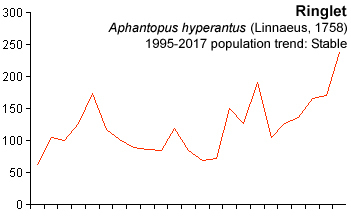 As with most other species, it did very well in the latter part of the 1990's, having especially good years in 1996 and 1997. There have been no exceptionally poor years and there are some signs that numbers have increased to a degree in recent years. Flight period: Carr listed it as occurring from 'the beginning of May until well into October' which remains the same today. There are usually three broods a year, often with great variation in the timing of the first, and there can occasionally be an overlap of subsequent broods. Adults can be found anytime from May to October. The first butterflies usually appear in the first week of May, but from the third week of April is not unusual. In 2006, there were no reports until June 2nd. The Spring brood is the smallest, peaking in May with butterflies continuing to fly well into June. Numbers build towards a second peak in August, which provides by far the majority of records. Numbers fall through September, but some adults will still be found on the wing on the last fine, sunny days of the Autumn. There are a number of November records, with the latest being November 9th 2006 - the same year which provided the latest ever Spring first date. Historical records: Described as 'local and nowhere very common' by Carr, who goes on to state that 'since 1857, when it was seen flying about the large Oaks by dozens (W. Rodgers) it has been taken in Sherwood Forest by numerous collectors'. 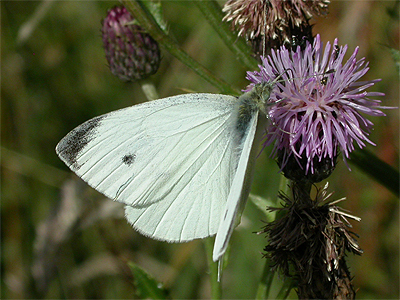 Another account stated that 'it used to be common at Theives Wood near Mansfield, but is now much rarer' (Daws, 1901), that it was frequent at Langford Moor near Newark, before Carr closes his summary of the butterfly with 'Mr Leivers and I saw this species flying in some numbers, round the tops of the Oaks in Wigsley Wood in August 1899'. Current distribution and status: Generally widespread, though not across all parts of Nottinghamshire, the Purple Hairstreak's arboreal habits make it very much an under-recorded butterfly. With a preference for woodlands containing Oak (Quercus), the Purple Hairstreak perhaps remains commonest (or better recorded?) around the Sherwood Forest and Clumber Park areas. It is well recorded from the Haywood Oaks, Wollaton Park, Langford and Spalford in the east of the county and from Cotgrave Forest in the south. It probably occurs in all decent sized woods, where it goes unnoticed. The adults rarely descend from the upper reaches of Oak, but males will often occur around Ash (Fraxinus) or other adjacent trees, utilising them as perches from which to wait for females or chase away rival males. On very hot afternoons, adults will sometimes descend to lower levels for a period of time. 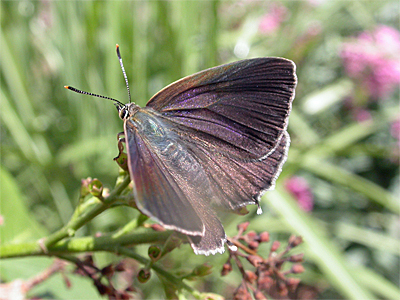 Nottinghamshire's Purple Hairstreak population has remained relatively stable since 1995, but it has experienced poor years where drops in reported numbers were followed by quick recoveries. The poor years came in 2001, 2007 to 2008 and 2012, which were also poor years for closely related butterflies such as the Small Copper and White-letter Hairstreak and a number of less closely related species. The graph on the left shows that it enjoyed several good years during the late 1990's and to a lesser extent the early part of this century following a poor 2001. 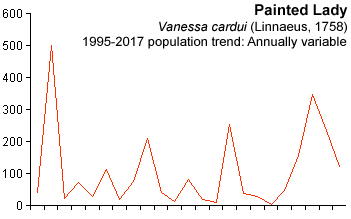 There is an indication that the butterfly's numbers reached a low point during 2007 and 2008, but there have been signs of a slight recovery since. Flight period: On the wing from early July until the second half of August, but there are occasionally earlier records around the last week of June. Peak numbers occur from mid-July till early August, but numbers soon become less although there are a small number of September records. Earliest and latest recorded dates are June 24th 2003 and September 21st 1997. Historical records: J.W. Carr describes this species as 'rare and local' in opening his species summary. He goes on to list few actual records, but writing in the Entomologists Weekly, W.H. Smith reported it from 'in the immediate vicinity of Nottingham in 1859'. Carr then goes on to list the following records, starting with 'once taken in Sherwood Forest' (Sterland) and 'along the brook near Edwinstowe, common every year' (Hardy). Brameld adds 'in the years 1858-1860, I took T. rubi plentifully in the woods about Mansfield'. Interestingly, Brameld uses the butterfly's former scientific name of Thecla rubi, rather than Callophrys rubi. Carr ends with records from 'Langford Moor near Newark, some seasons quite common' and 'occurs at Theives Wood, but very sparingly' (Daws); who in Carr's later Supplement relates that 'after an absence of many years, it turned up again in May 1920, in its old locality at Thieves Wood near Mansfield'. Current distribution and status: The difference in a butterfly's distribution a hundred years later is quite astonishing. The sites mentioned by Carr are all in the northern half of Nottinghamshire, apart from that reported by W.H. Smith. Aside from two Carlton Wood records in 2015 and 2016, the Green Hairstreak is very much a butterfly of southern Nottinghamshire. But it is an improving picture for this particular butterfly, as it appears to heve been slowly increasing its range for a number of years, although its recent history has been rather 'unusual'. It was recorded from three sites (including a Cotgrave garden) in 1995 and 1996, but not reported again from anywhere in the county, until it suddenly appeared at Bestwood CP and Sand Quarry in 2002. It remained at Bestwood for a number of years, but seems to have disappeared from there and has not been reported since 2006. In 2005, there were numerous Green Hairstreak reports from Rushcliffe CP, but just one report from 2006. It has not been reported from the site since and after another three years with no Nottinghamshire records, it turned up at Cotgrave CP (formerly Cotgrave Colliery) between 2010 and 2014, with an additional record from there in 2017. In 2014, it was found at Toton Sidings and there have been many Green Hairstreak records from this well visited location, where it continues to be reported from. Similarly, it has been present at the Nottinghamshire Wildlife Trust's Skylarks NR at Holme Pierrepont since 2014 and this remains one of the best places to see it. In the past few years, it has also appeared at Gedling CP (formerly Gedling Colliery), at nearby Netherfield Lagoons in 2016 and 2017 and at Bramcote in 2017. There is an unusual pattern to the Green Hairstreak's occurrence at most Nottinghamshire sites. For some inexplicable reason, it seems unable to survive at a site for more than a few years, and the complete lack of records for periods of four years (1998 to 2001) and three years (2007 to 2009) are worrying. It could prompt the case for suggesting the possibility of failed captive-bred releases, although the butterfly's Nottinghamshire range is one which would be expected from a natural recolonisation. Flight period: There is just a single brood each year. 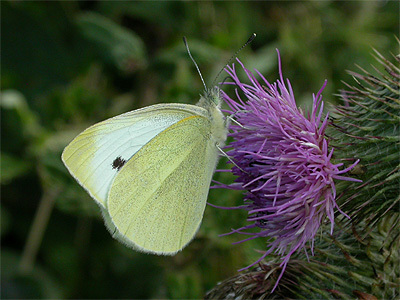 Most adults probably emerge at the end of April or early May, but there are several years when butterflies were'nt reported until the third week of May. It is difficult to give an accurate picture of the butterfly's flight period, based on the limited number of available records. Generally, the flight season is quite short and over by early June, with an obvious peak around the middle of May. In 2016, inclusive dates for Green Hairstreak at Toton Sidings, were April 19th to June 6th. Historical records: A positive opening statement from Carr, stating 'widely distributed in the county and locally common, adding 'Barrett's statement of 'very rare' in British Lepidoptera Vol 1 p47, is certainly far from the truth'. Carr goes on to add that 'Sterland records a single specimen taken by himself in the Forest near Thoresby; Brameld took one at Wellow Park in 1859 and Daws, one at Teversall in 1870. More recently it has been captured in New Park Wood, Rufford and several times in Wellow Park (Becher); in the latter place also by Leivers. Lady Robinson has taken specimens near Checker House station, in Clumber Park and in Park House gardens at Worksop - all of these between 1893 and 1899'. Carr seems to have seen White-letter Hairstreak himself on many occasions. He mentions that he 'took one at rest on Ragwort flowers in a field near Worksop in July 1900. Mr Leivers has seen several specimens at Langford Moor near Newark and I have recently found the larvae commonly on Wych Elms in a spinney near Lowdham'. Carr then rather unusually gives a more detailed account, declaring that 'the headquarters of the species in Notts are however, the woods and spinneys, mostly on the Lias and Boulder-clay soils in the extreme south of the county. In many of these, it is positively abundant and may be taken freely in all stages'. The butterfly is summarised again in 1935, when Carr publishes the 1935 Supplement to his original book. In it, he only lists records from Bevercotes Park near Tuxford in 1924 and Roehoe Wood, Widmerpool, where it was 'common on Privet bloom in July and on Ragwort in August 1925'. 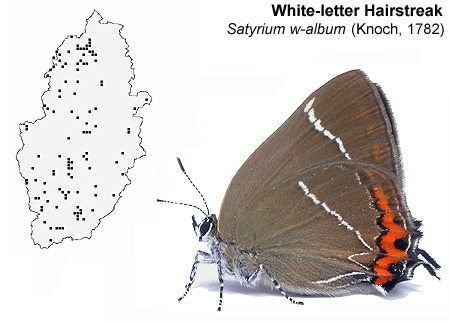 Current distribution and status: The number of modern White-letter Hairstreak records, have showed considerable annual variation. 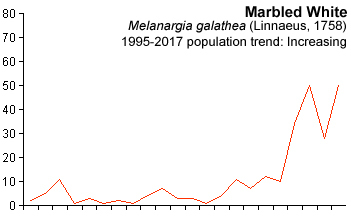 Like most other butterflies, it has had a succession of peaks and troughs since the mid-1990's, but is perhaps better recorded now than it has ever been. We have described its status as 'stable' despite the great fluctuations in the number of records. It clearly did well in 1996, between 2004 and 2006 and since 2014. After the effects of Dutch Elm disease, it was thought that this butterfly would decline enormously and disappear from many of its former locations. But it has clearly uses Elm regrowth for egg-laying and appears not to have been unduly affected and is a relatively easy butterfly to track down in the county. Although it is very much arboreal, this is not a butterfly confined to the county's woodlands and can be found along mature hedgerows, parks and open spaces, as long as Elm (Ulmus) is present. 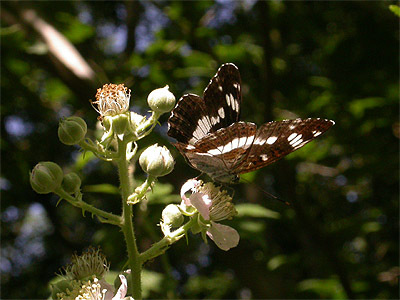 It is much more likely to be found nectaring at flowers than the Purple Hairstreak and is especially attracted to Bramble flowers. It is widespread, but rather thinly scattered across Nottinghamshire, but there are large areas of the county producing no recent records. In north Nottinghamshire, it is well recorded from the Ranskill/Barnby Moor and Dyscarr Wood areas. Further south, there are numerous records from Duke's Wood, the Calverton/Lambley area and from Colwick CP and Cotgrave Forest. It appears to be absent from much of the Mansfield area and north of the Trent Valley at Sutton-on-Trent, to areas north and east of Retford, including the Idle Valley up as far as Misson. Flight period: The first adults usually appear from the first week of July onwards, producing a rather sharp peak later the same month. They continue to fly into August, but the flight season is pretty much over by the middle of the month. Historical records: There appear to be no reliable historical records of this butterfly from Nottinghamshire. Carr certainly does not list any, nor does he believe Sterland's list of the Lepidoptera of Sherwood Forest, in which he claimed it as 'not uncommon' in Sherwood Forest. Carr justifies his disbelieving of Sterland by stating that 'it is not mentioned in Brameld's far more reliable list, nor has any later entomologist recorded it. Nevertheless, the locality is by no means an unsuitable one, as old Holly trees are abundant in parts of Sherwood'. Current distribution and status: The Holly Blue established itself in the county sometime during the 1900's, but the lack of available information means it has been difficult to trace a first date for VC56 Nottinghamshire. A 1989 record from Clumber Park may be one of the county's earliest. Now very much a common Nottinghamshire butterfly, there are probably as many records originating from urban areas as there are rural areas. It is distinctive and usually found flying around trees and shrubs in parks and gardens, where it is hardly likely to be mistaken for any other species. The distribution map reflects the number of records from the more urban areas of the county. The greatest concentration of records is from the Nottingham and its suburban surrounds, especially running in a broad band south-west to north-east through the City. 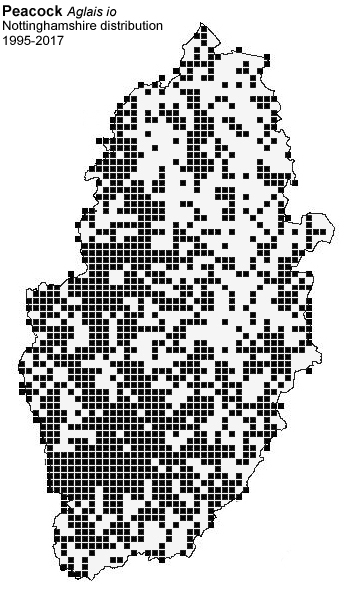 Other concentrations of 1km grid squares, show the towns of Mansfield, Worksop and Newark quite easily. It is also known for the frequent variations within its population, which are thought to be caused by Listrodomus nycthemerus - a small parasitic wasp. Parasitisation by the wasp occurs in the larval stage and emergence is from the pupa. Holly Blue numbers were high during the early 1990's, but dropped suddenly in 1995, though had recovered by 1997 when there was something of an explosion in numbers. This reached a peak in 1998 and numbers of the butterfly have never been anywhere near that level since. Records and numbers since 1999 have showed some annual variation, but nothing to the scale of that experienced in the late 1990's. 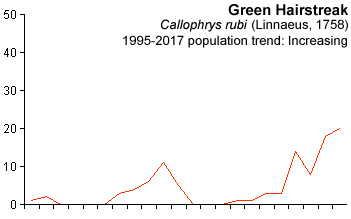 The graph shows a general increase in Holly Blue records over the past ten years, with something of a drop in 2017. As this is being written (late May 2018) numbers seem to be well up again. Flight period: There are a number of March records, but emergence is generally from the middle of April onwards. 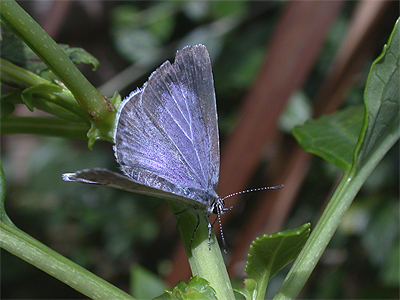 The Holly Blue has two broods during the year and adults have been recorded in all months between March and October. Pronounced activity peaks occur in May and from late July to early August. The flight period is largely over by the middle of September, but there are a number of later records, but the reliability of some may be questionable. Historical records: This species was obviously scarce and confined when Carr was gathering known records from the county in the early 1900's. He states 'common in Sherwood Forest' (Brameld) and that it 'used to be constant in one restricted locality in Clumber Park' (Lady Robinson). Carr also states that 'several specimens taken by the side of Rainworth Water near Fountaindale in July 1885, also two taken at Sookholme Moor' (Daws). The only other mention Carr gives is 'this species is included in a list of butterflies taken in the immediate neighbourhood of Nottingham' in 1859, by W. H. Smith and published in an edition of the Entomologists Weekly. 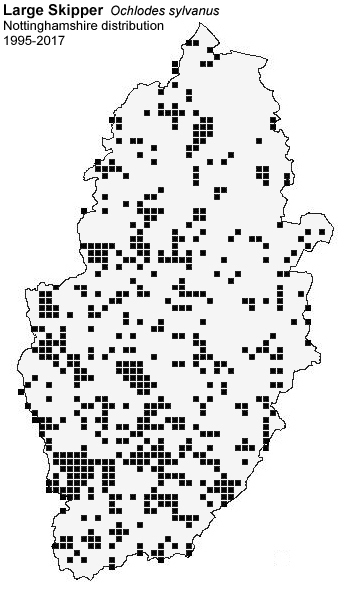 Current distribution and status: Long since extinct in Nottinghamshire, it does not appear to have been recorded from the county since the late 1800's. The records listed by Carr appear to be the last known. Historical records: Carr never listed Brown Argus as having occurred in Nottinghamshire, although it had allegedly been recorded by Sterland at the time. It was known from SK77 (near Kirton) and SK73 (near Hickling) between 1940 and 1957, although it has to be said that neither area looks to have much in the way of suitable Brown Argus habitat on first impression. Current distribution and status: Apparently reappeared in the county after a gap of approximately 40 years in 1997, when one was recorded along the disused railway line near Bingham (Birch, Dr, A.). The same year also saw the Brown Argus recorded from Holme Pierrepont, along a former colliery railway line at Gedling, a disused railway line near Newark and along another disused railway line at Cotham. It has to be said that we view both the SK73 and SK77 records with some scepticism, in view of the percentage of agricultural habitat found within both areas today. 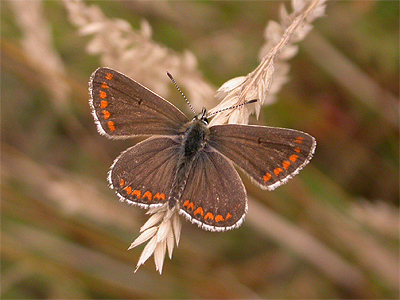 Whatever the reliability of the county's historical records, the Brown Argus has colonised Nottinghamshire as part of a northerly range expansion. It is now found widely at many sites throughout the county and has been recorded from most of the county's former Collieries. Since its return (or arrival, depending on your point of view) to Nottinghamshire, the number of records produced each year has been a series of dramatic highs and lows. However and despite the variation, the Brown Argus is still increasing here. It is found in discreet colonies, never in any obviously large numbers and often only occupying a small area of any site. It is a butterfly which prefers generally open, sunny habitats and is often quick to colonise undeveloped brownfield sites, especially when these are left for a number of years. Its preferred larval foodplant has always been Common Rock-rose (Helianthemum nummularium), but this plant has a restricted range in Nottinghamshire, preferring calcareous soils on chalk and limestone. The colonisation of such a wide range of sites, has been due to the Brown Argus using Common Stork's-bill (Erodium cicutarium) or Dove's-foot Crane's-bill (Geranium molle) as larval foodplants. This has seen it become much less fussy regarding its habitat requirements and make it one of our most successful butterflies of recent years. Flight period: There are two broods a year, with the Spring brood being unusual in that it is often rather flat with no definable peak. The first adults emerge around the second or third week of May and the number of records received for May, June and July are all remarkably similar. The second peak occurs in August and is much more pronounced. Butterflies continue to fly until around mid-Sepember, but there are a series of very late records from Barrow Hill Sand Pit in October 2002 and 2006. These dates are extremely late for Brown Argus and probably relate to misidentifications. Historical records: 'Carr summarises this species as being 'very common and universally distributed', even going so far as to give us some indication of flight period, which he records as 'early in May to, and sometimes, the end of October'. Current distribution and status: Both the Common Blue and Holly Blue are the only 'blue' coloured butterflies to occur naturally in Nottinghamshire. This is a widespread butterfly, fairly typical of a wide range of habitats and is likely to be present at any site where the larval foodplant of Bird's-foot Trefoil grows. Although widespread, it's distribution does become rather patchy and it is generally less frequent from north-east of Nottingham and it's suburbs, to north past Retford. 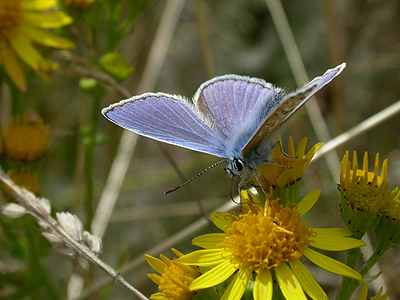 Like so many other butterflies, the Common Blue has benefitted from the closure of the county's Collieries. Quick to colonise any post-industrial brownfield site, it was another pioneering species of most former spoil heaps and can now be found in good numbers at many of them. It is a butterfly of generally open sites containing a wealth of nectar-bearing flowers and will sometimes be encountered along more open woodland rides. It often turns up unexpectedly, but is hardly ever likely to occur in suburban gardens. Despite a number of fluctuations, the Common Blue has enjoyed two notable periods of good numbers, when it did particularly well in the latter-half of the 1990's and again a decade later from 2009 to 2011. The number of records dropped to more normal levels during the interim years and it certainly suffered three successive poor years (as did most Nottinghamshire butterflies) from 2006 to 2008. Overall, there have been signs of a slight increase in numbers since. Flight period: There are two broods a year. In Spring, the first butterflies usually appear from around mid-May, but there are a number of April records. The flight season very much depends on the overall temperature during the first few months of the year, but the Spring brood tends to peak in June, with adults still on the wing throughout much of July. 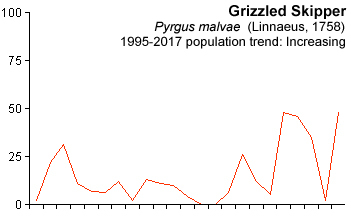 The second brood typically peaks in August and this peak is more pronounced and better populated than earlier Spring brood. Butterflies continue to fly into the late Summer and will be present at many sites during September. The are a number of October records.